Fukuoka is a city located in southern Japan in the Kyushu region. It has a population of approximately 1.5 million people making it the most populous city in the Kyushu region and the 5th largest in Japan in government-designated cities. Though it is a dynamic metropolis, it stands up to its nickname of “a compact city” and has an incredibly welcoming feel. Being that Fukuoka also hosts its own airport, it is extremely convenient to travel to from other countries or domestically in Japan. 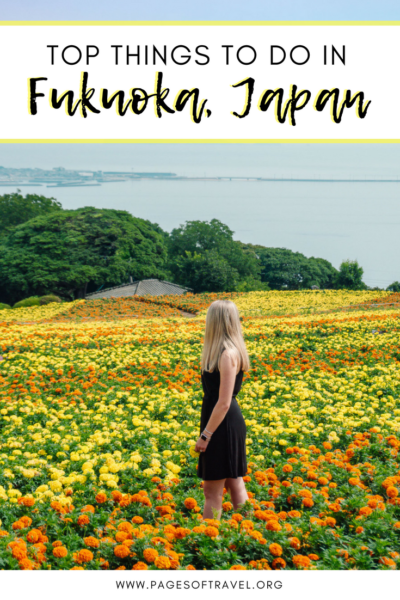 Naturally, it makes sense to add this Fukuoka itinerary if you are considering to make a road trip around the Kyushu region. 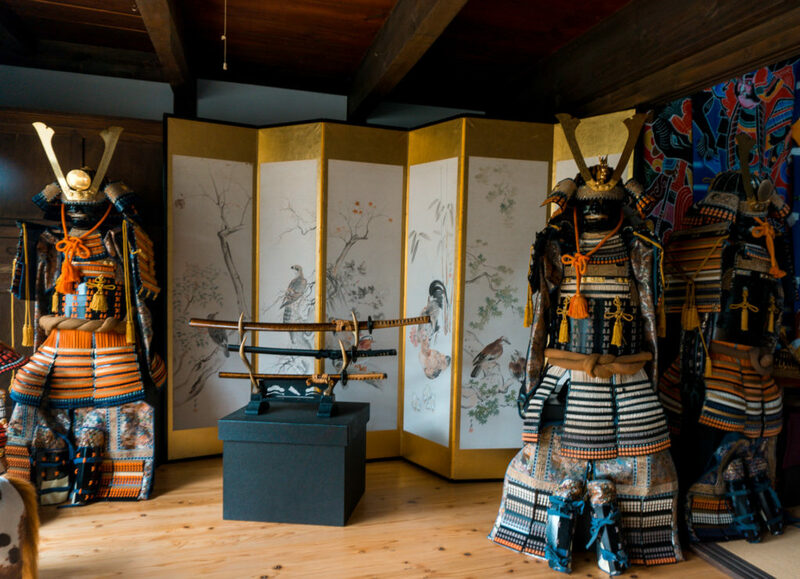 The city has an impressive history of temples, shrines, festivals, flower parks, beaches, and of course food – which is what Fukuoka is often most known for. Disclaimer: We want to thank Fukuoka CVB for inviting us as their guests. This post includes affiliate links which we may make a small commission from. As always, we only recommend products and places we love, all opinions are our own. 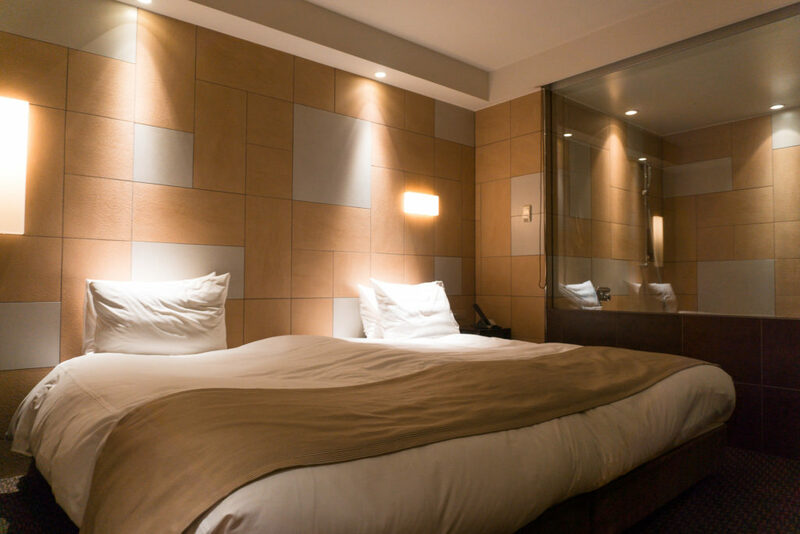 If you are looking for a hotel that is in a convenient location for your Fukuoka itinerary then Hotel Il Palazzo is perfect for your stay. If you are traveling Fukuoka by car there is also parking at Hotel Il Palazzo which makes it easy to park your vehicle and walk around Fukuoka City or use public transit. What we loved most about Hotel Il Palazzo other than having the ideal location, were the spacious rooms that contained many unique features. The rooms had numerous romantic touches for those traveling as a couple and had plenty of space to be family-friendly as well. 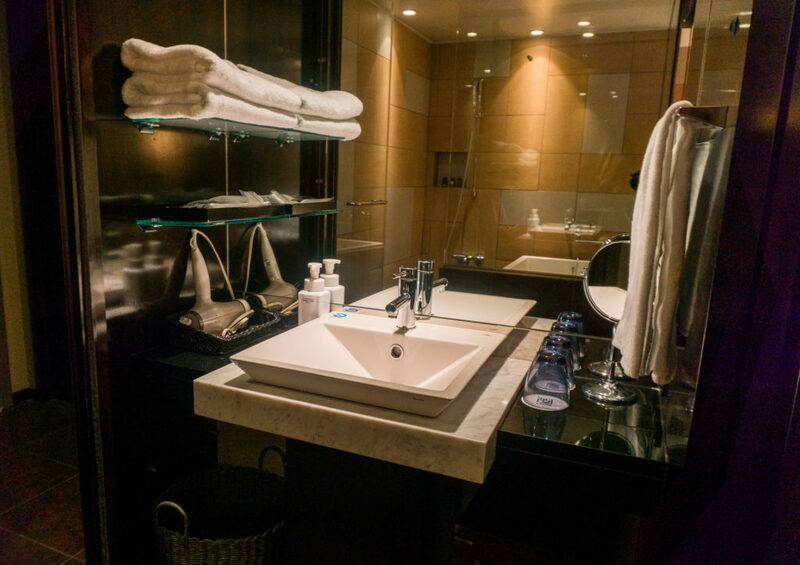 When you walk in you’ll immediately see a private lavatory followed by a stunning shower and bath area with glass all around you. In the closet area, we were impressed by the amount of storage space for our luggage and were able to unpack a few items to use within our stay. On the other side of the closet is another sliding door but no it’s not more closet space! It’s actually where the room’s sink and amenities are held. We found this to be a nice touch in order to save space in the bathroom area and add more space to the rest of the room where the main feature of the room was the largest hotel bed we’ve ever seen, and we don’t mean just by Japan’s standards. The bed and pillows were heaven, perfect after a long day of walking and exploring the city. 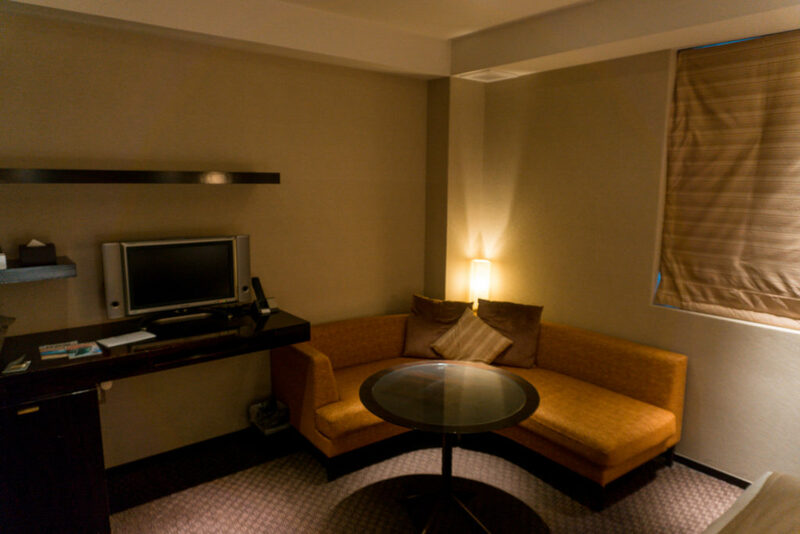 Another nice touch our room had was a sitting area which was the perfect place to relax after a long day or watch some television. The bed Hotel Il Palazzo was HUGE and so comfy! We started our day by visiting Uminonakamichi Seaside Park which is a large, leisurely park that is located just outside of the city. 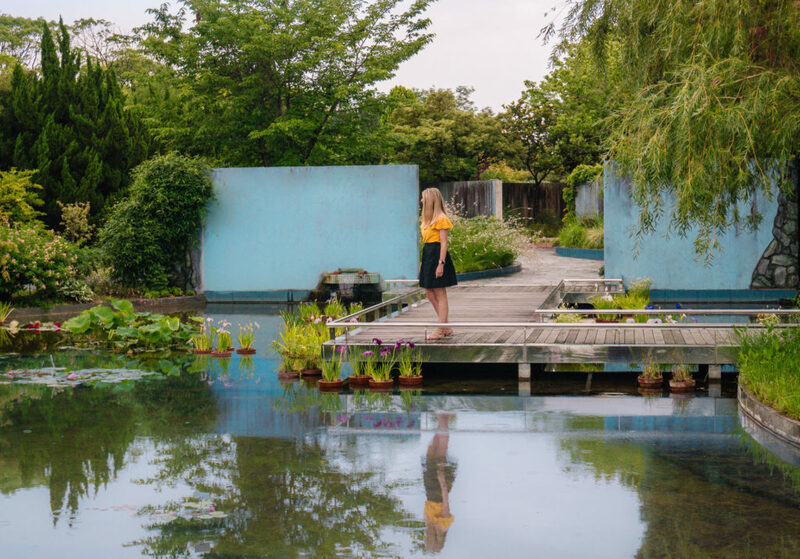 At this Fukuoka attraction, you can enjoy beautiful flowers and plant life that vary by season. During the time we visited in the summer, hydrangeas were in season. 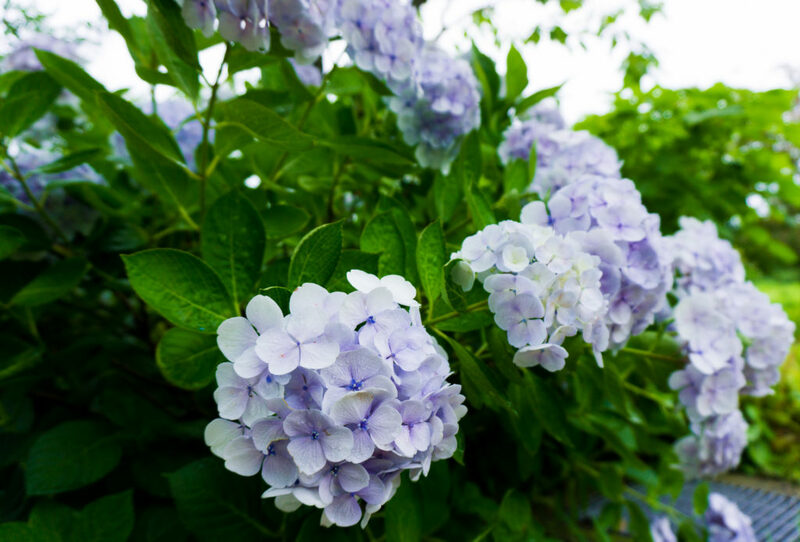 Uminonakamichi Seaside Park has over 40 different species of hydrangea with a total of over 10,000 flowers that provide a beautiful floral scent as you walk through the park. We spent a good portion of our morning strolling around the park admiring the tranquil water features that were lined with beautiful flowers. The hydrangeas at Uminonakamichi Seaside Park were stunning and fragrant! 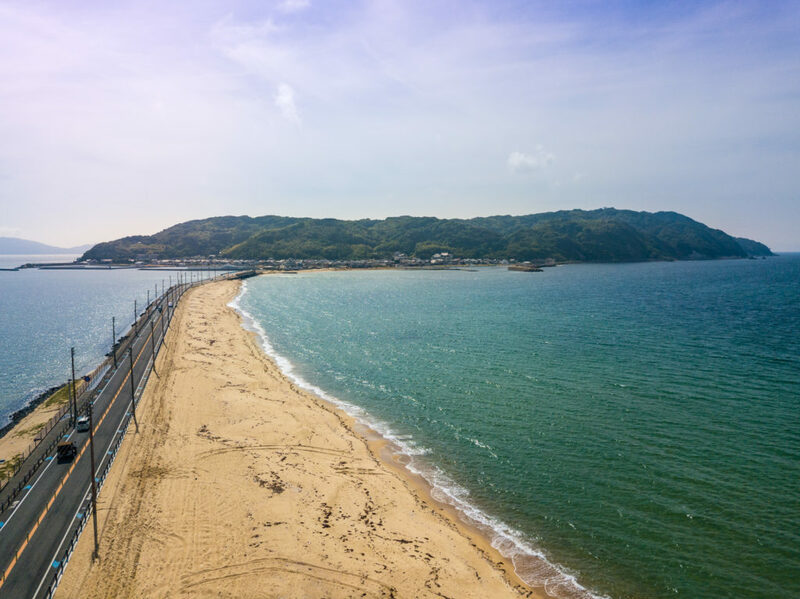 Uminonakamaichi Seaside Park doesn’t just boast flower fields and gardens, it also contains the largest swimming pool in western Japan, accompanied by six smaller pools, and even water slides to cool off on a hot summer day. Best of all? This waterpark is included in your admission price! 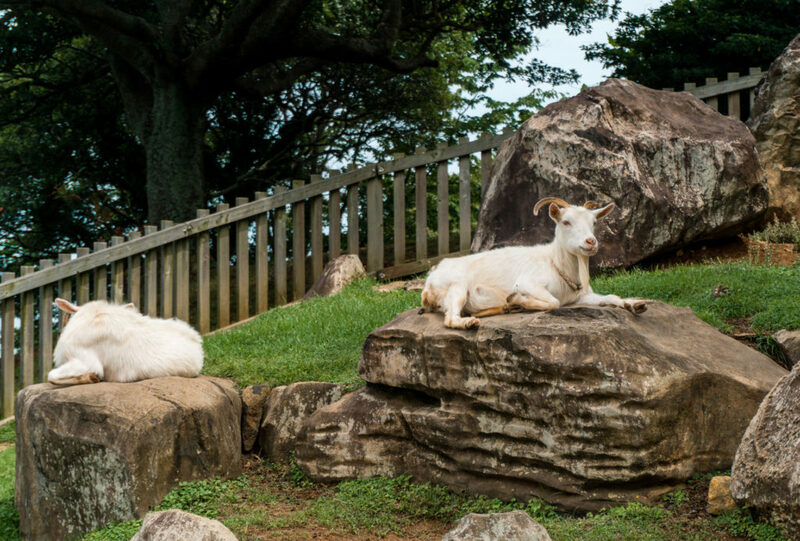 Other experiences you can have while at Uminonakamaichi Seaside Park include animal encounters featuring capybaras, kangaroos, squirrel monkeys, prairie dogs, flamingos, and swans. As well as a free woodworking class that includes plants and wood scraps found in the park. We wish we had time to ride bikes here for a few hours! Since the park covers roughly 300 hectares (~740 acres) one option for transportation is that you can take a trolley around the park. Each ticket is 200 yen for one way, or you can purchase an all-day pass for 500 yen. If you’re looking for a more personal way to view the park there are also bicycles available to rent where you can head out on your own and ride along the 12km paved trail. There are four different stations you can rent bikes from and you can return them at any of the four you desire. Be sure to stop by the Shiomidai Lookout while on your bike ride to see the spectacular view of the nearby Genkai-nada Sea. One of our favorite ways to experience a new city is by biking. 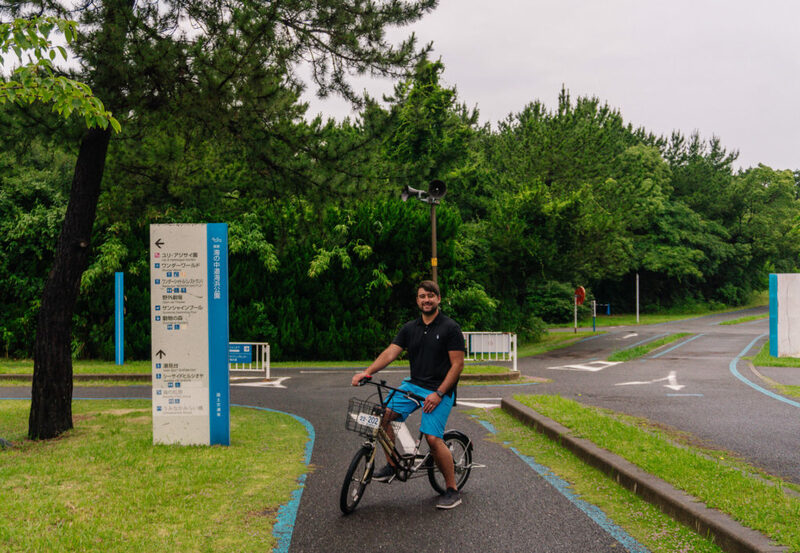 At Shikanoshima Island, you can easily enjoy the entire area in an afternoon by bicycle which is what we did next! 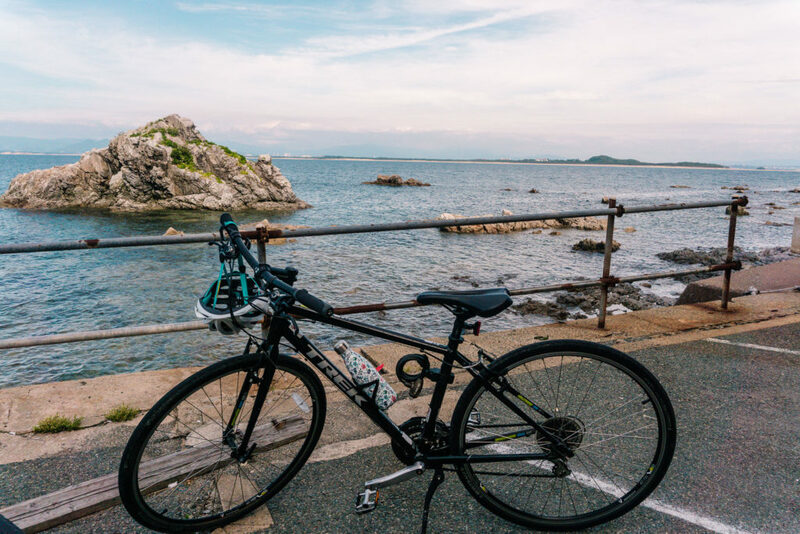 Shikashima Cycle is the perfect place to rent a high-quality bike to tour Shikanoshima Island. 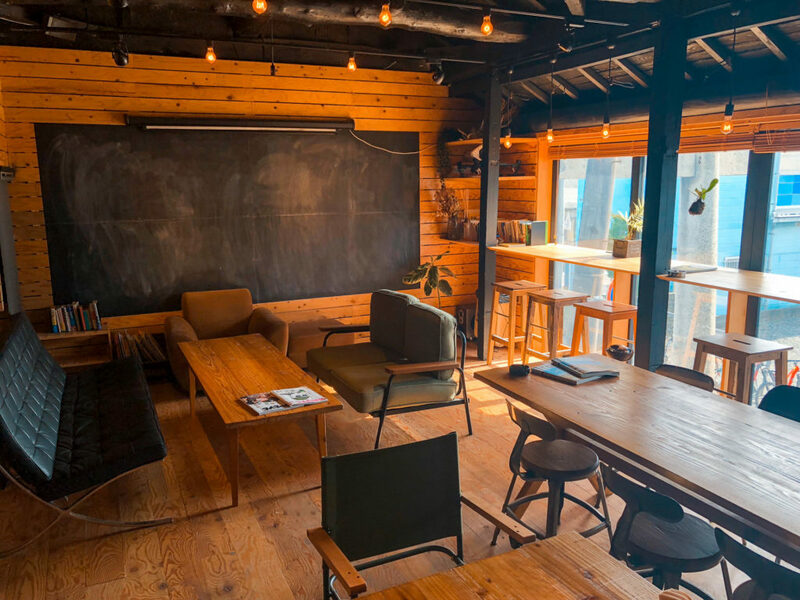 The upstairs area of Shikashima Cycle is perfect to lounge in after your bike ride! The entire island is roughly a 10km ride and takes about one hour to complete without stops. 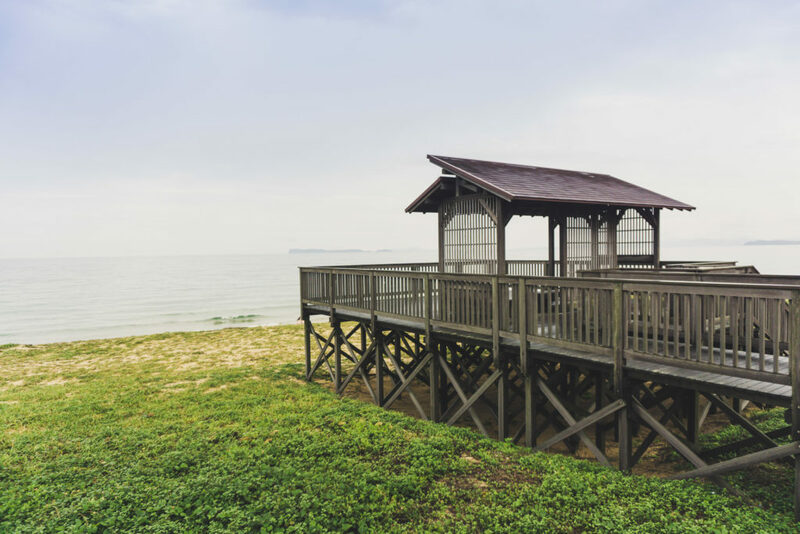 However, there are many places we recommend you stop at while you enjoy the beautiful ride around the island including Shikanoshima Bridge and Beach, Shikaumi Shrine, Shiomi Park, and Nakanishi Shokudo for lunch. 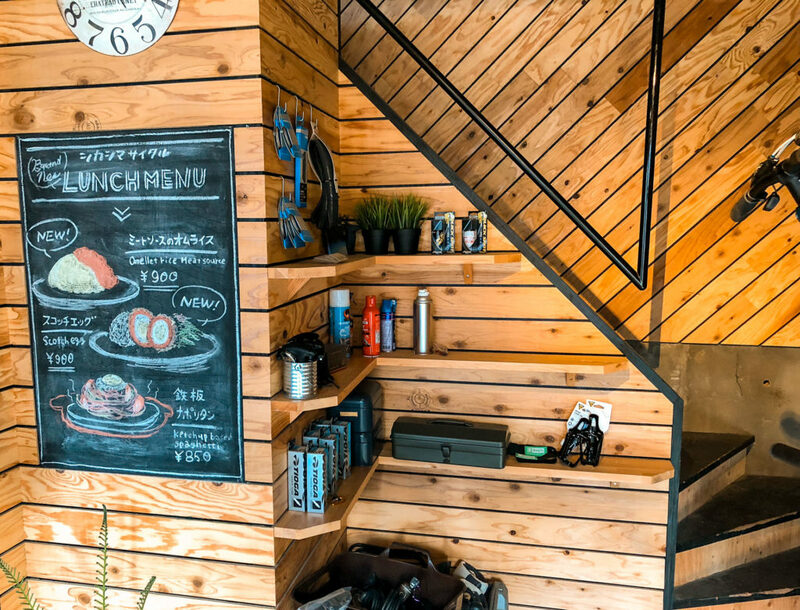 After your bike ride, make sure to enjoy a delicious beverage at Shikashima Cycle’s cafe. 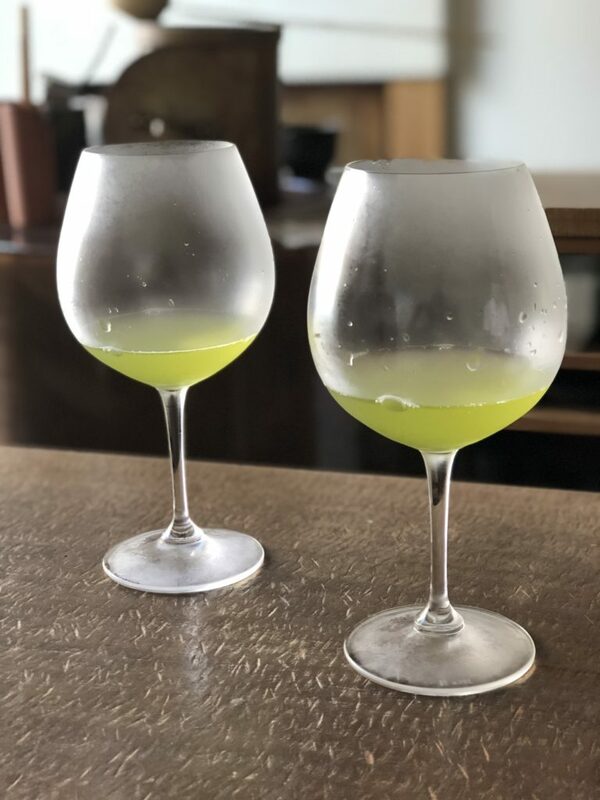 Shikanoshima Island is known for their oranges, so we made sure to try their summer seasonal drink, a bitter orange soda made with meddled oranges and mint that came locally from Shikanoshima Island. It was the perfect way to refresh after the workout! The orange and mint soda was so refreshing after our bike ride! 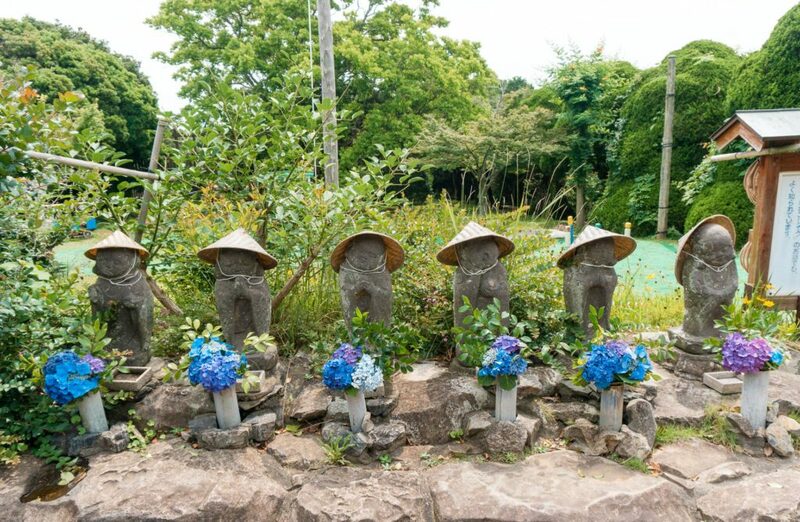 Shikaumi Shrine is dedicated to the three gods of the sea. 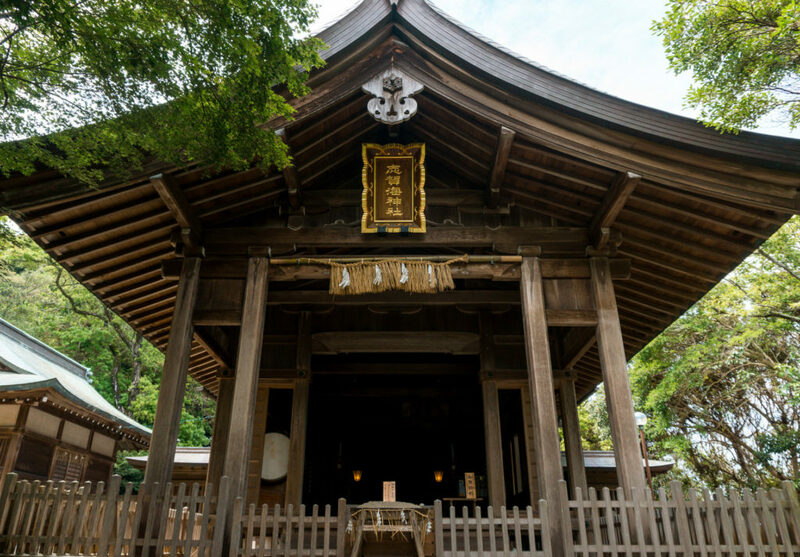 While the exact age of Shikaumi Shrine is unknown, it is dated to be at least 200AD; the physical shrine you can visit today has been there for over 400 years. 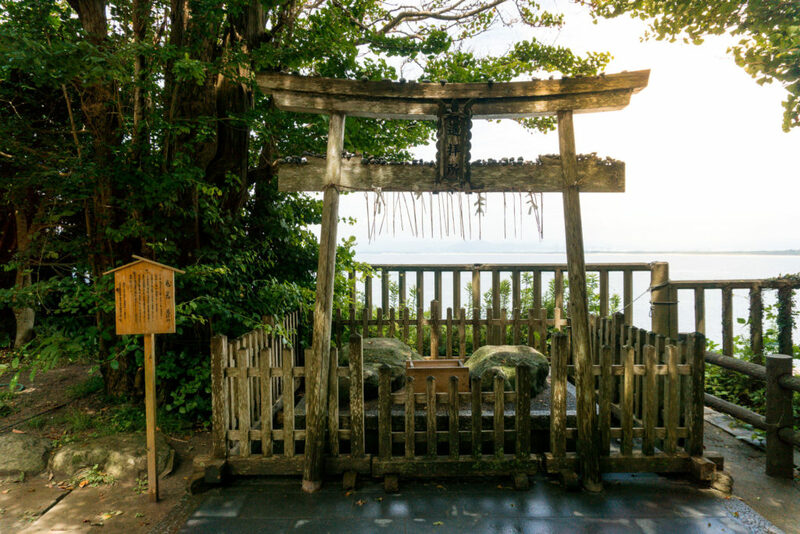 If you are on a bike ride, walking, or driving, it is worth a pit stop to see this beautiful shrine tucked away in the forest with a beautiful view of the bay. 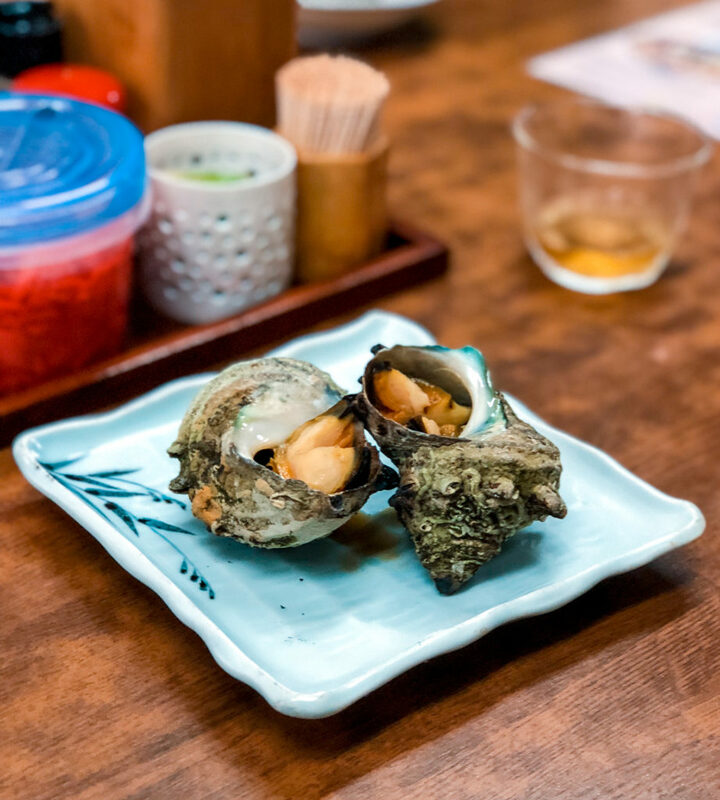 If you decide to visit Shikanoshima Island, you must try this Fukuoka food specialty, sazae, also known as turban shell. 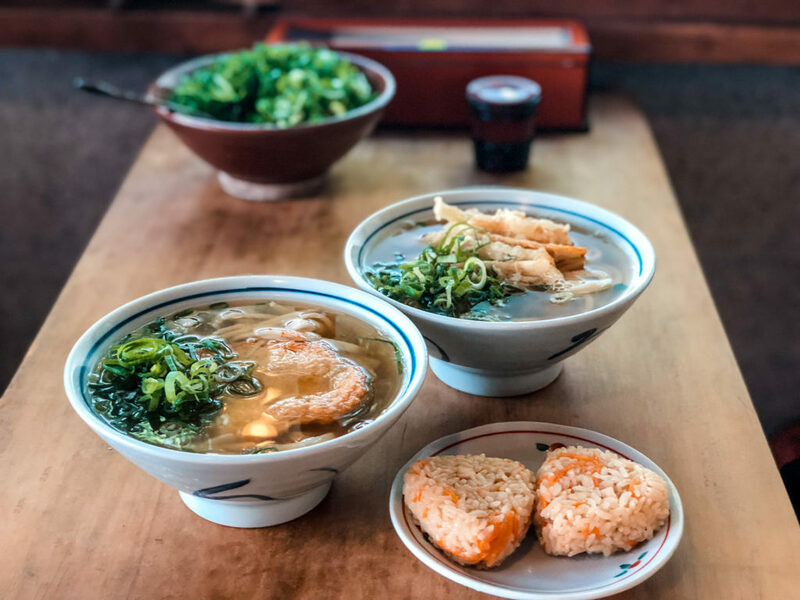 Nakanishi Shokudo is known for having fresh and delicious sazae that you can order as a side cooked in a light broth or enjoy in one of their meals. Our sazaedon bowls came out piping hot with a side of miso soup. 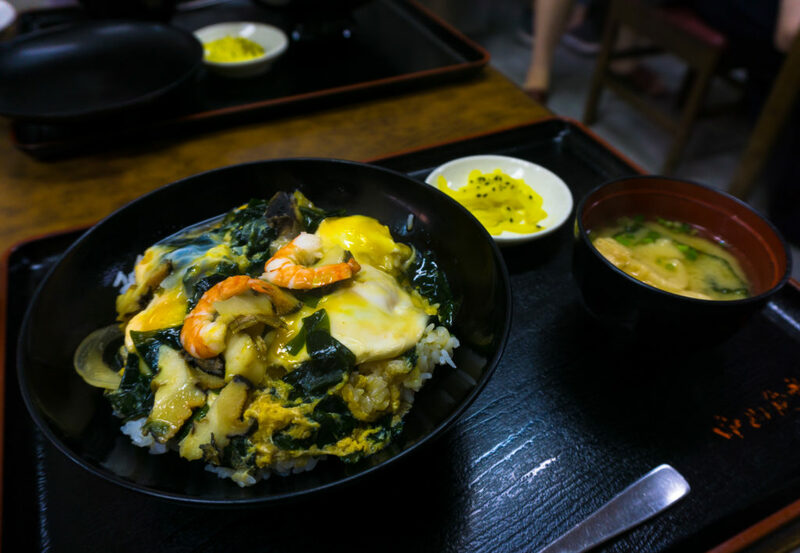 The meal was hearty and quite different from other rice bowls we’ve had while in Japan. We highly recommend you try sazaedon while on Shikanoshima Island if you’re looking for a unique and authentic dining experience. Canal City Hakata is a mall and entertainment complex that is so large it has been called a “city within a city!” Numerous retail stores, restaurants, cafes, live theater, cinema, and beautiful water features are found within the confines of Canal City. It was built in 1996 and is reported to be the largest privately developed project in Japan, with over 17 million people visiting annually! 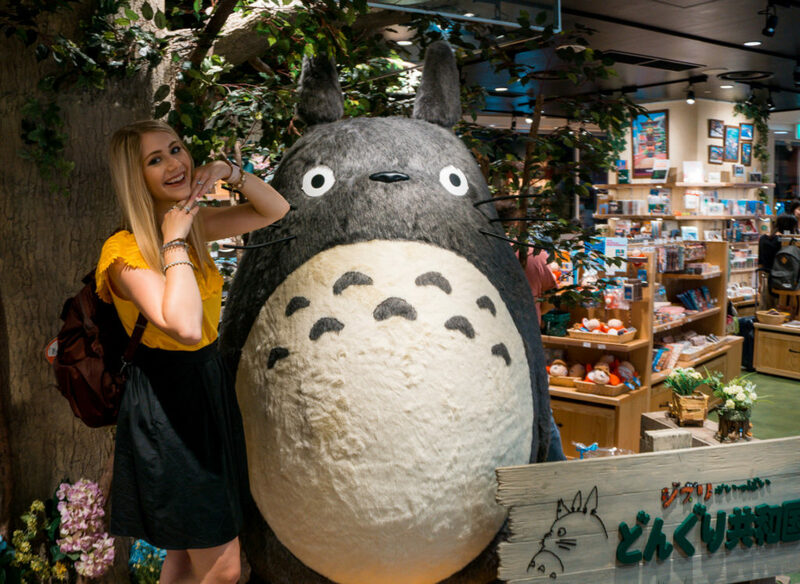 There are many different stores to shop at Canal City Hakata, a few of our favorites include Donguri Kyouwakoku, a character store based on many of the Miyazaki films, Dagashi Yumeya, a shop that has a lot of Japanese traditional or novelty snacks and sweets, and DesignPocket a store where you can buy and/or make food replica items that are common in Japan! 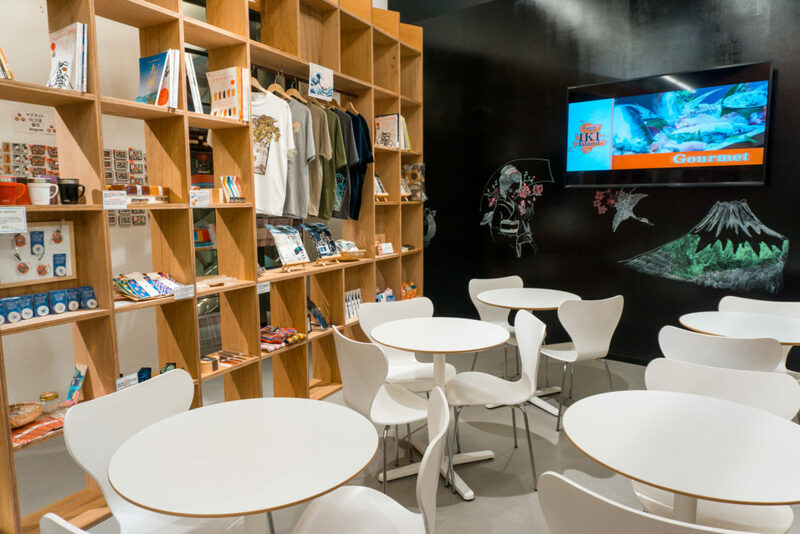 For international travelers, there is a tourist information center on the first floor of Canal City Hakata. Staff is available to provide information about Canal City Hakata, Fukuoka, or even the entire Kyushu region free of charge. 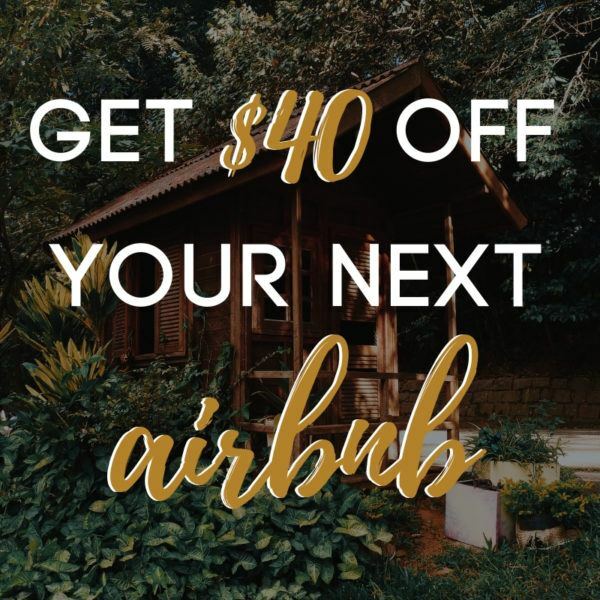 You can also rent a kimono or ninja costume, make a t-shirt with Japanese calligraphy, place your luggage in a storage locker, or enjoy a light snack and drink! Seating area of the tourist information center at Canal City Hakata. 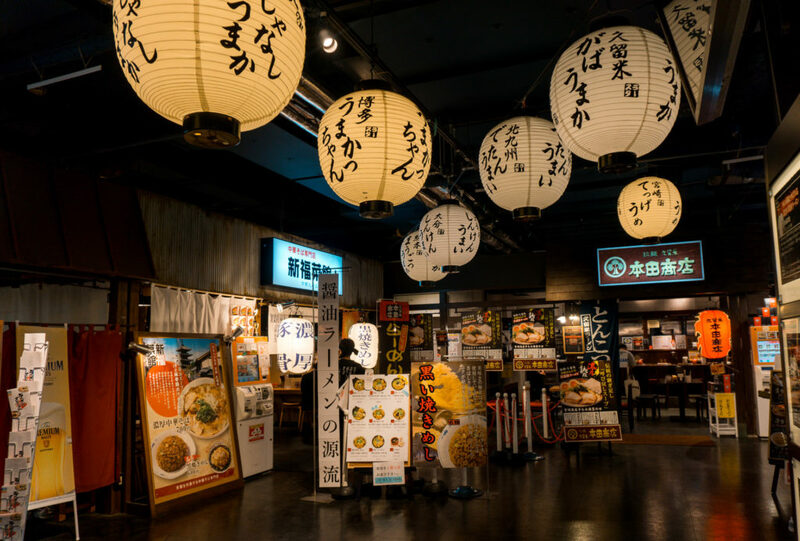 On the 5th floor of Canal City Hakata is the Ramen Stadium which has a collection of some of Japan’s most iconic ramen shops from various regions or prefectures of Japan – including the famous Hakata ramen in Fukuoka. 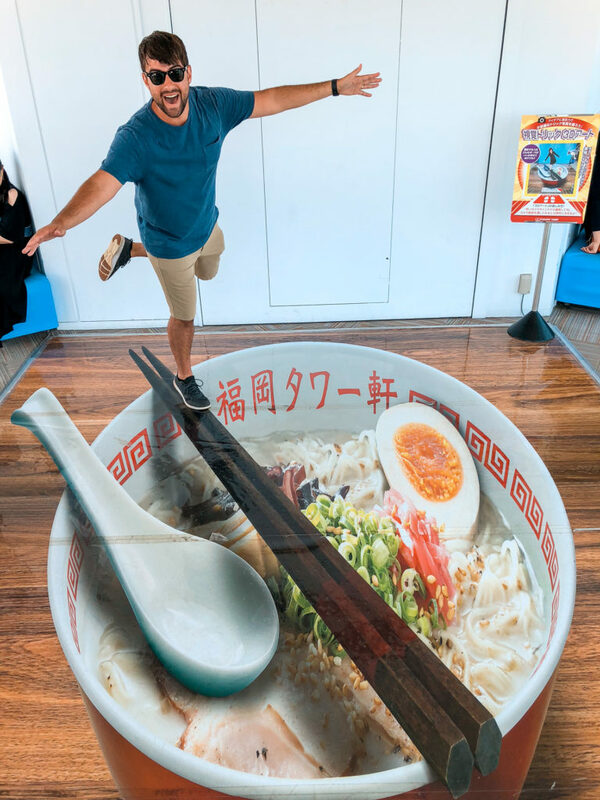 Just head to the top floor, buy a meal ticket from one of the vending machines and line up – you’ll soon be served a delicious and piping hot bowl of ramen! While Canal City Hakata is bustling during the day, it comes to life at night with the Aqua Panorama Show which features a 3D projection map combined with water fountains, neon lights, and electric sounds. 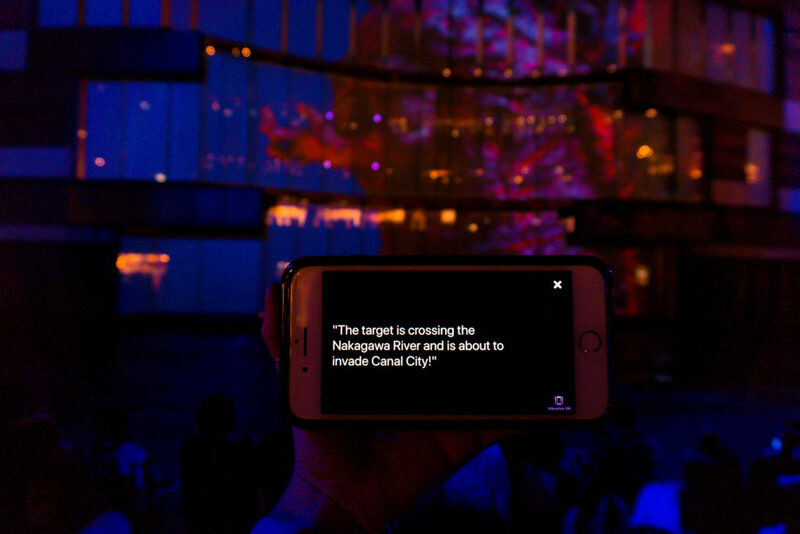 On weekends between 8:00pm-9:00pm there is a free interactive show. 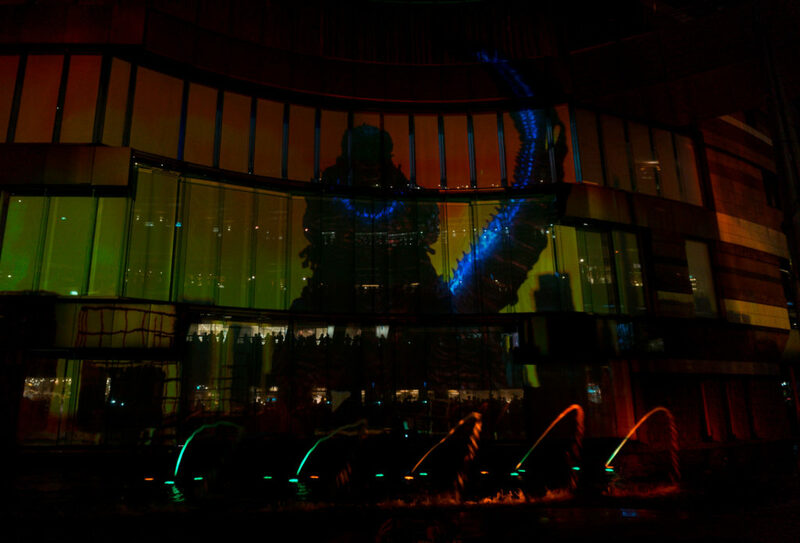 During our visit, we were faced with the mission to protect Canal City Hakata from Godzilla’s attack! 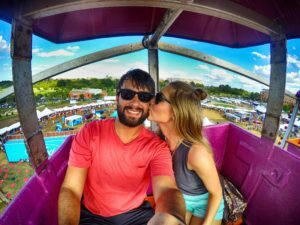 It was WILD and is such a fun to have an interactive activity to enjoy with friends, family, or as a couple. Simply follow the link via the QR code provided. Godzilla has attacked Canal City! 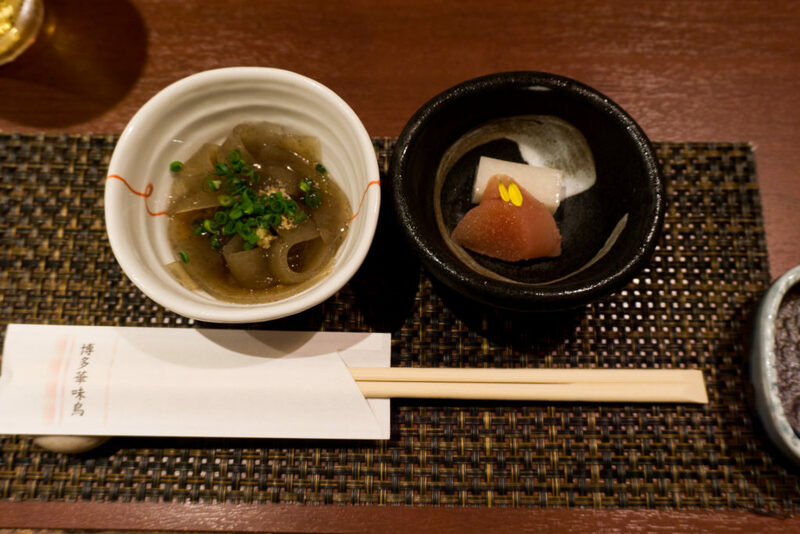 Hakata Izumi is a two-star Michelin rated restaurant that is well-known for fugu (or blowfish). 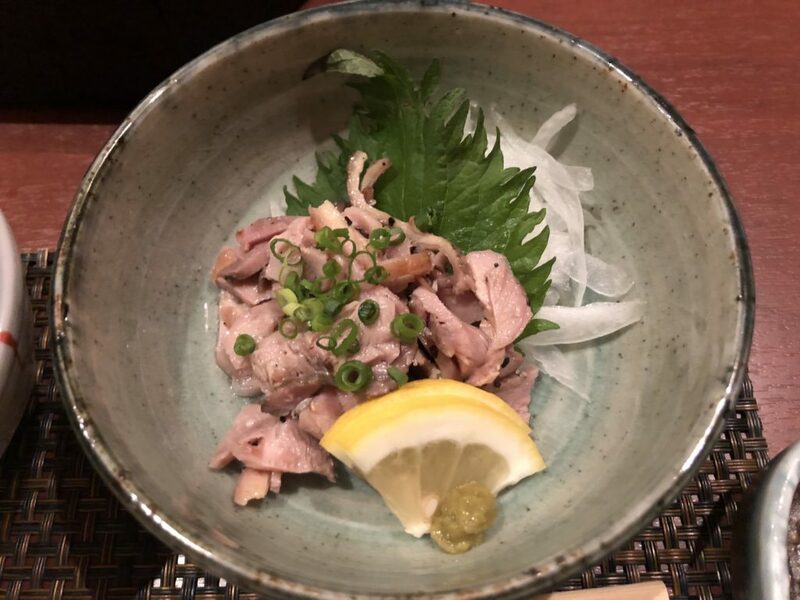 Miyatake-san is the head chef at Hakata Izumi, and Fugu is a tradition that has been passed down in his family for generations. It takes years of practice and strict licensing by the government to be able to prepare fugu as some parts of the first are poisonous – so this one might not be for those faint of heart! Fear not though, as Miyatake-san is a master of his art and prepared a once in a lifetime meal for us that we thoroughly enjoyed. 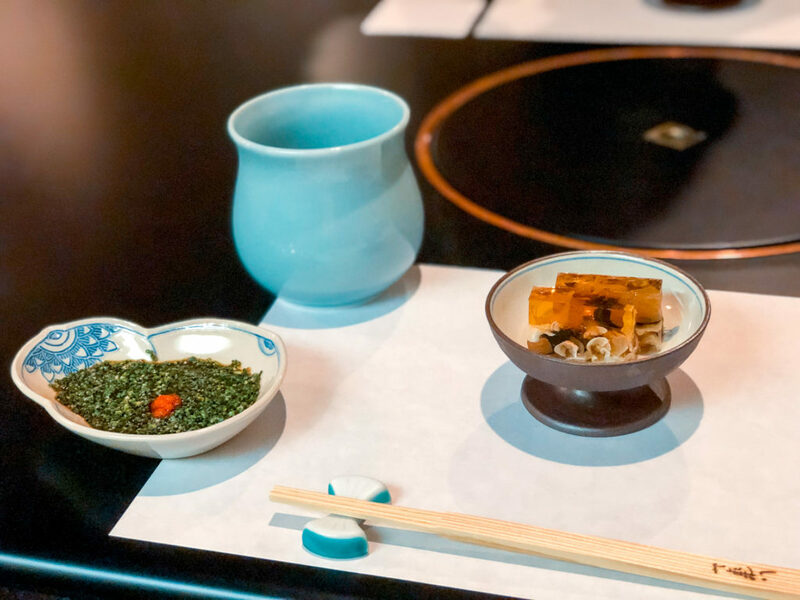 During our dining experience at Hakata Izumi, we selected one of the menu set courses which allowed us the opportunity to try fugu prepared in a variety of ways. 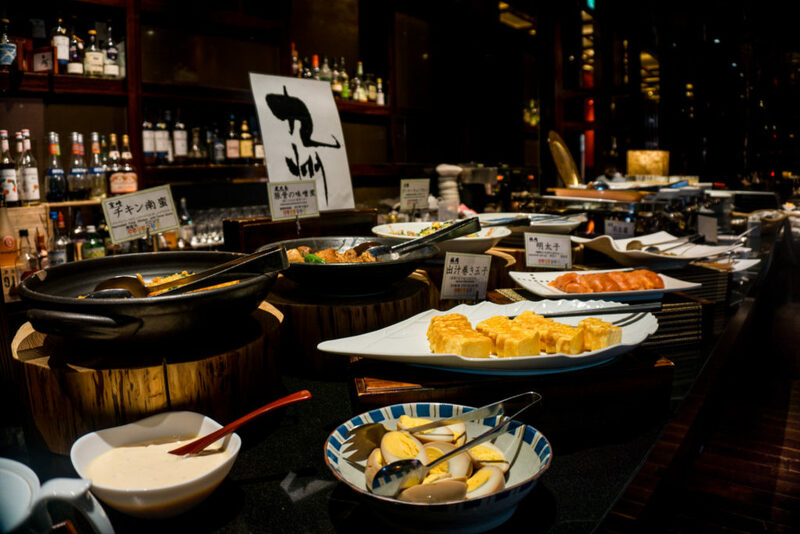 Our course included an appetizer, sashimi, deep-fry, hotpot, porridge, and a dessert. We first had an appetizer of a fugu sake gelatin. 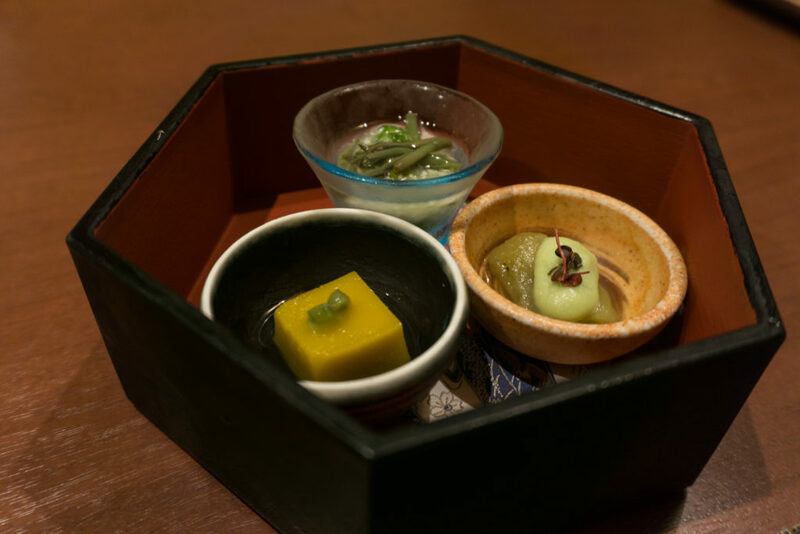 The chilled, smooth texture of the gelatin absorbed the preserved flavor of the sake and the fugu. The first course we had was fugu sashimi which is sliced with extreme precision by a technique called nimaibiki making each piece razor thin. Each piece is then meticulously placed to create a visually appealing flower shape. Since fugu has absolutely no fat and is all cartilage the texture is slightly chewy and the savory flavor is enhanced by a house made ponzu sauce with green onion and some spices. We also tried the fugu sashimi with an olive oil and sea salt dipping sauce which changed the flavor completely! We recommend trying it both ways to see which you enjoy best. 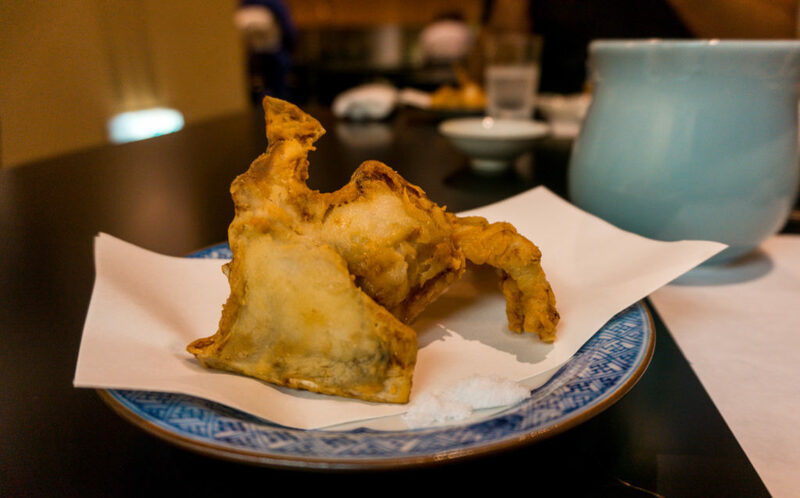 Next, we had deep fried fugu (fugu karaage) which was coated in a tempura batter and enhanced the umami aspect of the flavor. Unlike most fried fish, the crispy coating was not overly greasy and closely resembled fried chicken. It was one of our favorite ways fugu was prepared. 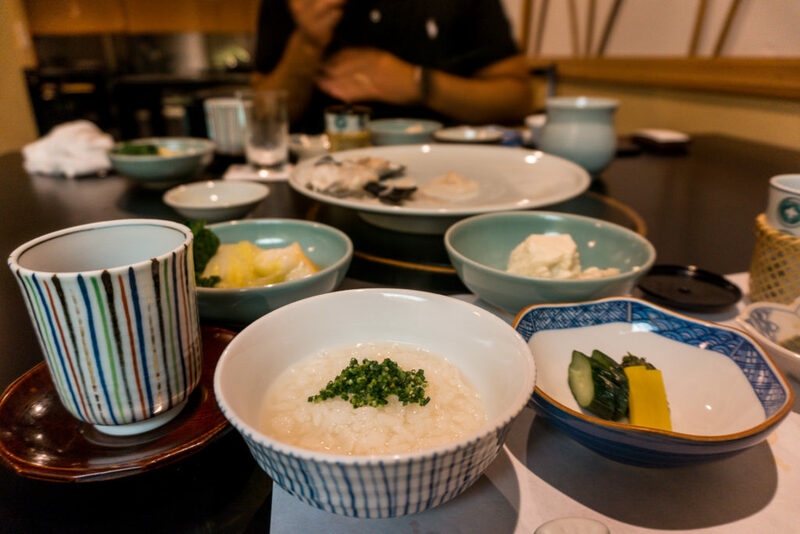 Afterward, we tried Fugu hotpot which was cooked in a light broth and accompanied by a porridge rice and vegetables which both were cooked in the same broth to capture the fugu flavor. This was the most subtle flavor of all the preparations and the meat was tender due to the slow simmering in the broth. For dessert, we had a slice of fresh watermelon. 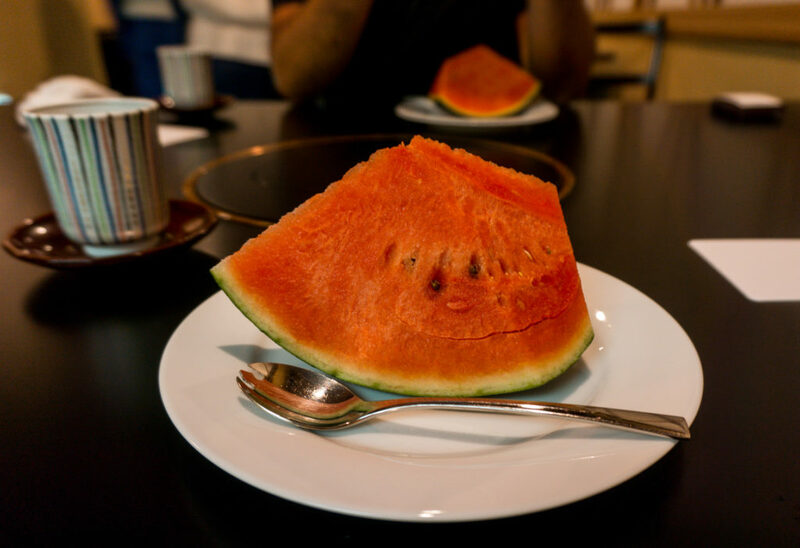 Watermelon is considered to be a more of a delicacy in Japan as it is typically expensive due to its low availability. It was extremely sweet and refreshing! 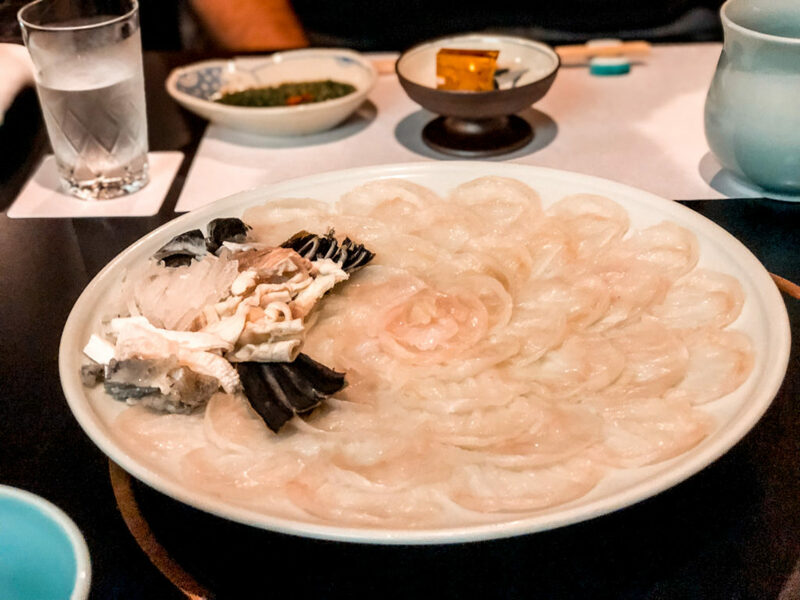 Our first experience with fugu was an experience unlike any other, and we highly recommend it to those who are looking to try something new and exciting. 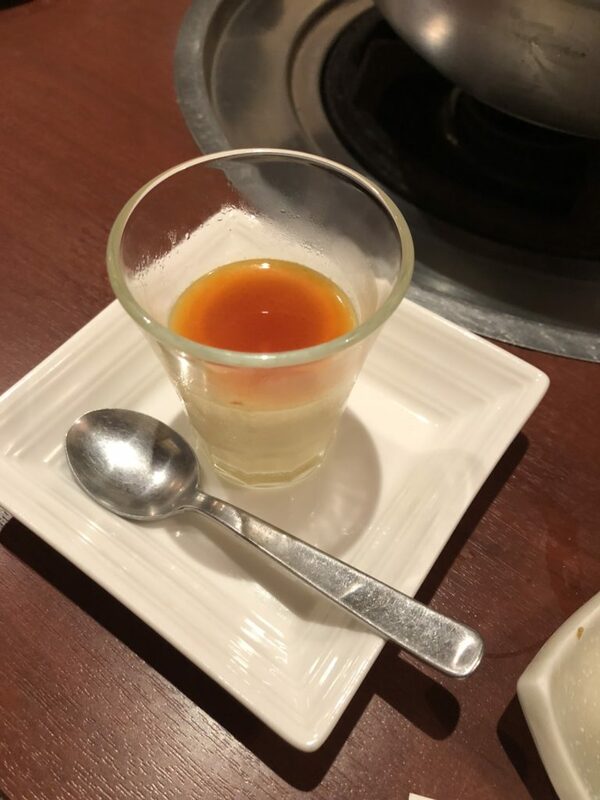 Yes, we know this is more food but we wanted to give you another option for dinner AND if you do decide to dine at Hakata Izumi like us you’ll want to visit this anyways. Feel free to stroll around to work up your appetite again because the Yatai food stalls are open late! 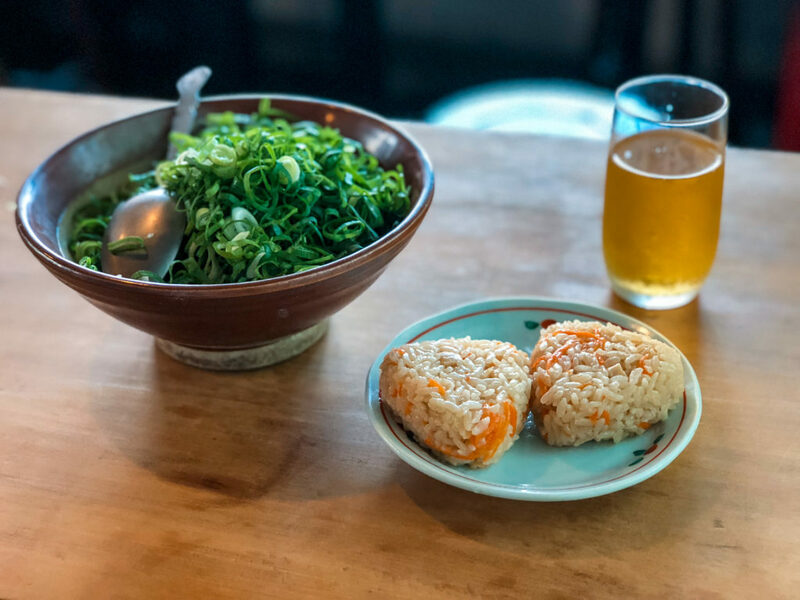 Yatai is a dining experience that is completely different than dining at a typical restaurant or grabbing some street food and moving on. It is chaotic, lively, and often you may come as a stranger and leave with new friends. 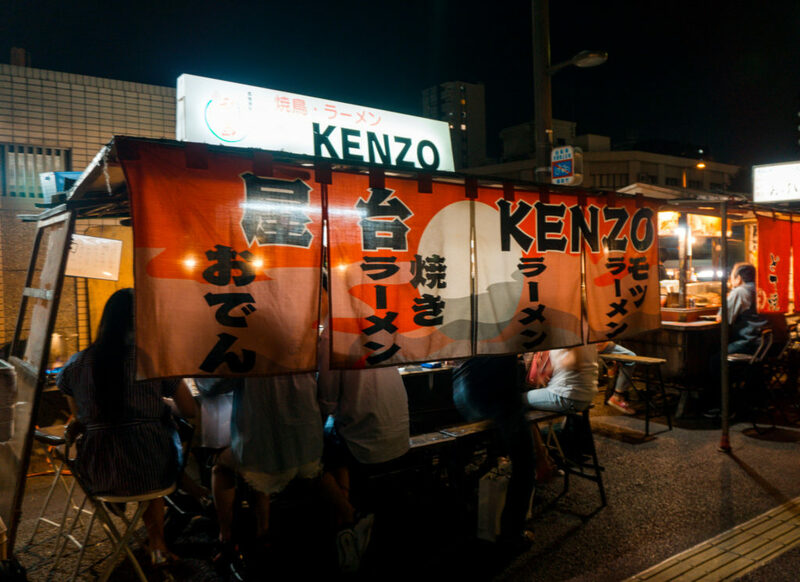 KENZO Yatai food stall where we tried yakiramen! 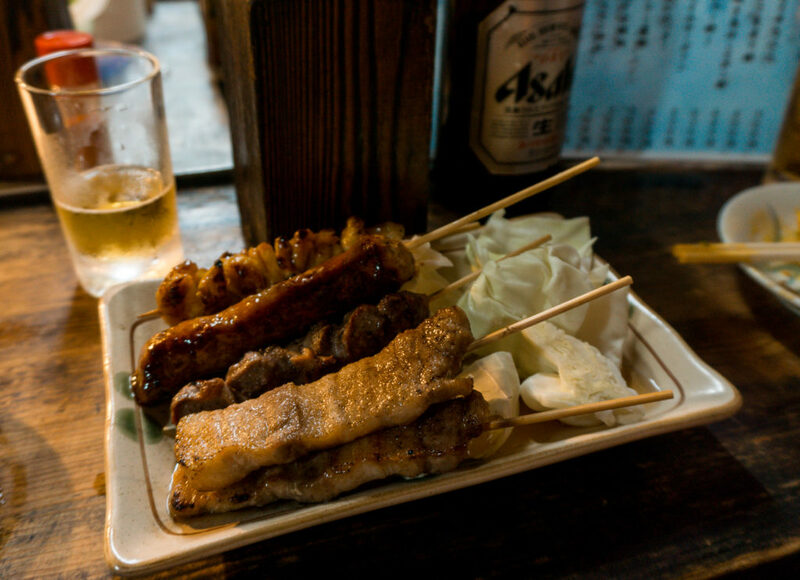 We jumped into a yatai food stall that specializes in yakiramen or a pan friend ramen that comes without a bowl of broth and various kinds of yakitori. Yakiramen from KENZO yatai food stall. After a few beers and some grub we made friends with some locals and travelers at the stalls who had been jumping to many different yatai that evening. 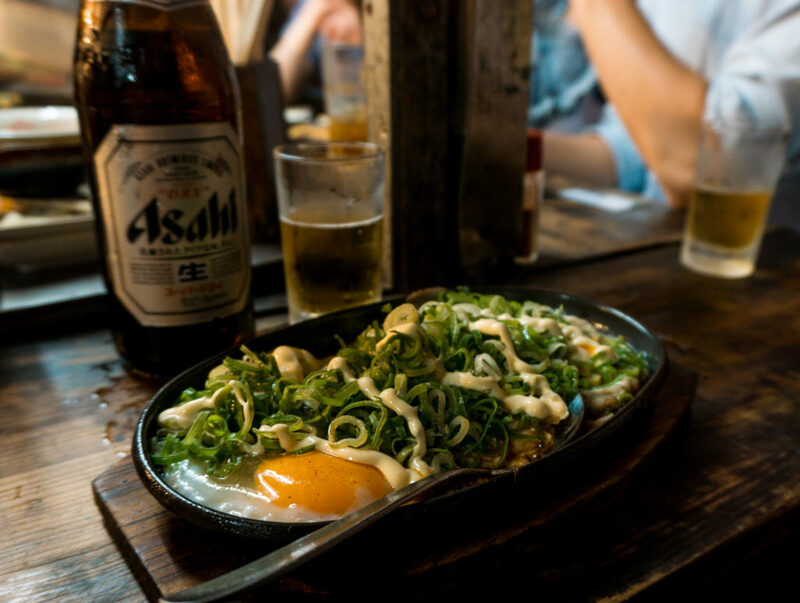 Yatai is perfect for a late-night snack which is how we enjoyed it, but don’t be afraid to grab dinner by jumping to a few different stalls and make a night of it! 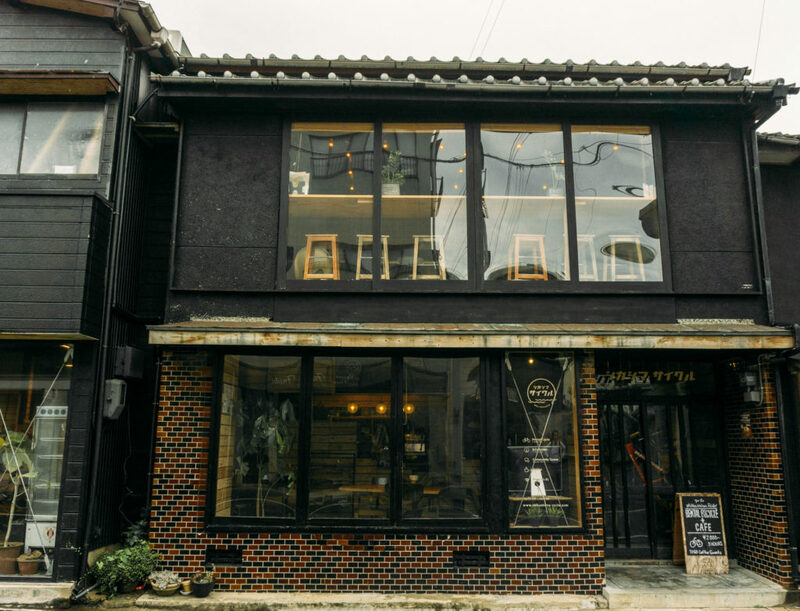 Start your day off early with this cherished place in Fukuoka! Hands down this place is one of the highlights from our time in Fukuoka and we hope you love it too. Before heading to Nokonoshima Island we grabbed breakfast at our hotel (they have a FABULOUS spread) and then drove in our rental car to the ferry stop for Nokonoshima Island is a paradise that is just a quick ferry ride away from Fukuoka City. While only around 700 people live on Nokonoshima Island year round, the island has many local and foreign visitors annually. 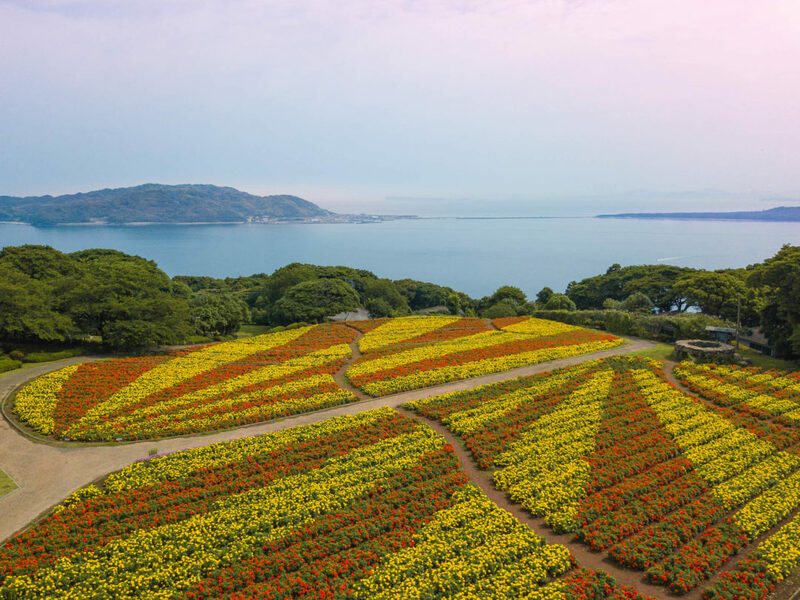 One of the most beautiful areas of Nokonoshima Island is the flower fields which showcase different species depending on the season. 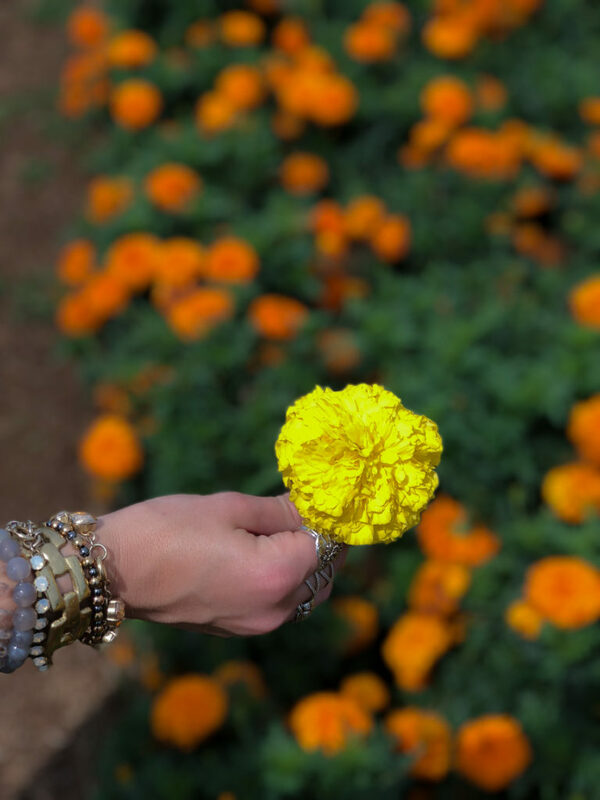 During our visit, we were able to see golden yellow and bright orange marigolds that were radiant in the summer sun. A unique feature about the flower fields is you can pick as many flowers as you’d like for no additional charge! 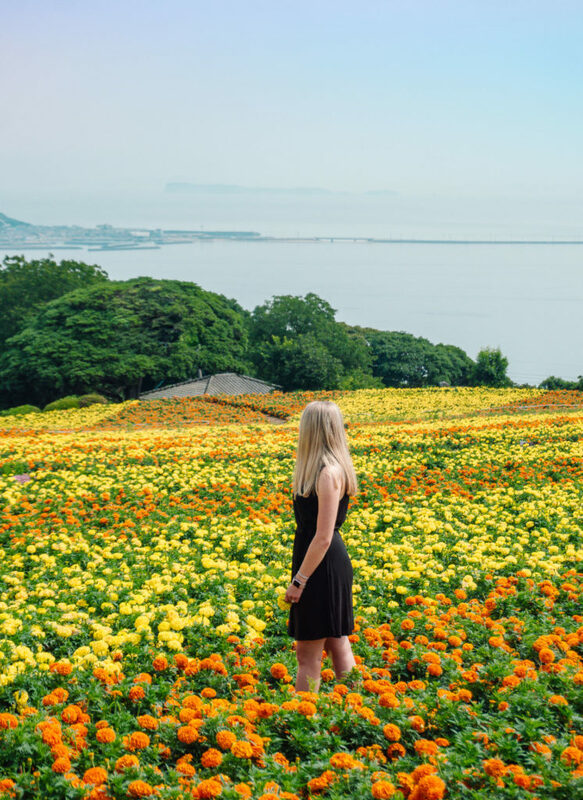 The view and the flowers on Nokonoshima Island is simply breathtaking! 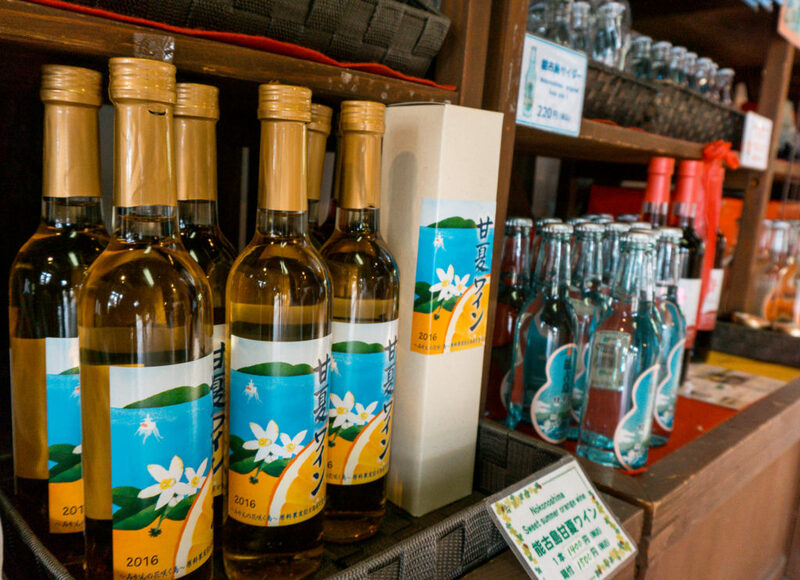 While many come for the flower fields, Nokonoshima Island has many other activities to offer visitors. The island boasts their own matsuri (festival) including one for children that takes place in February-March. 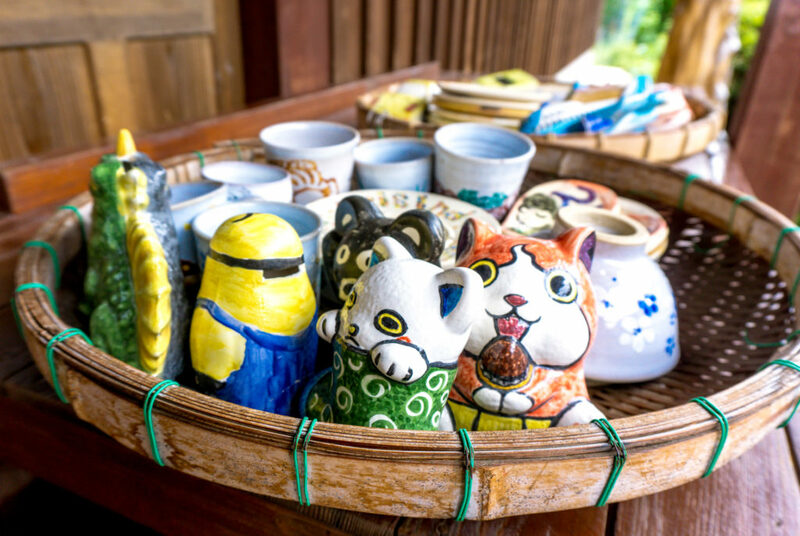 There are various playgrounds for children to enjoy, a volleyball court, NokoNoko – the islands own version of 9-hole golf, a petting zoo area, soccer field, gift shops, and an art house where you can create and decorate your own pottery piece. Needless to say, which such a variety available on the island and you’re sure to find something for everyone to enjoy. Since there are so many experiences to be had, you can easily spend a day visiting Nokonoshima Island. No need to makes plans to leave for lunch or dinner as there are quite a few restaurants that you can dine at on the island including Sakimori (the island’s specialty) which has a charcoal grill with fresh meat, seafood, and vegetables, as well as Noko Udon (an udon noodle shop), and Cafe Yumeji which has tea and cakes. If you plan to stay the night at Nokonoshima Island there are two different areas you can rent a place to stay. 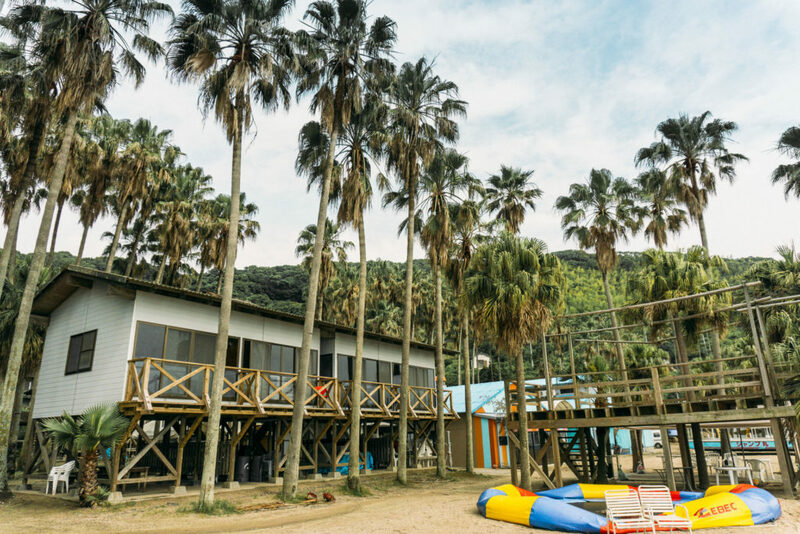 In the summer months, you can enjoy a seaside stay at a Nokonoshima Camp Village where you can barbecue and enjoy many other amenities including a floating trampoline, banana boats, and swimming. While Nokonoshima Camp Village wasn’t open during our visit, we still had the chance to enjoy the beach views and see the behind the scenes preparation for the summer months. 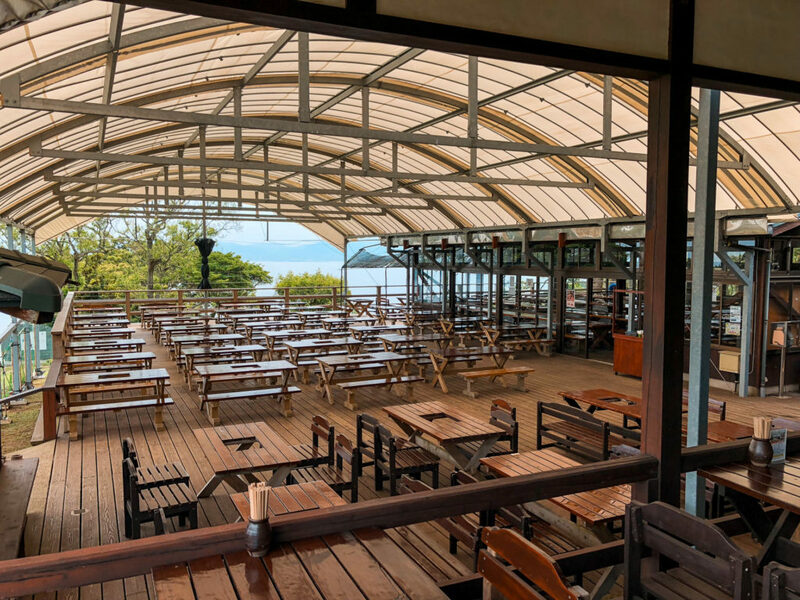 At night, you can light fireworks or build a campfire while enjoying the calm Hakata Bay view. 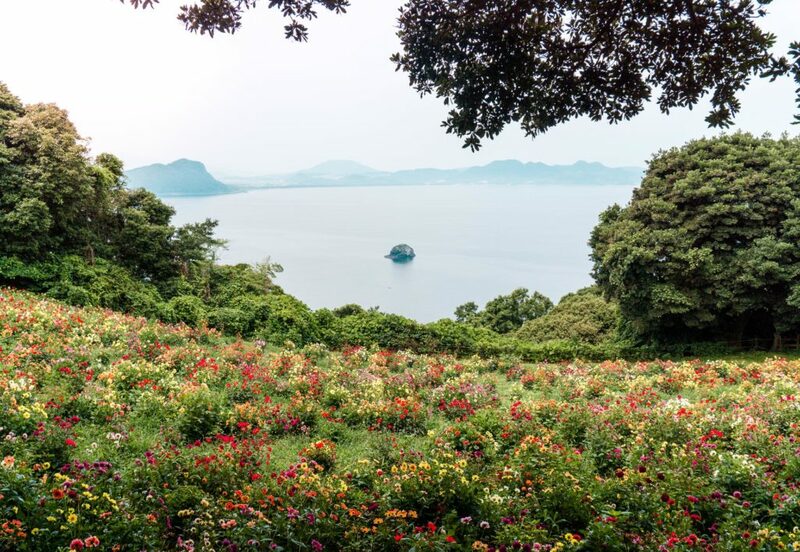 Another place available for lodging is a villa at Sakimori-no-Sato which has a view of the flower gardens and Hakata Bay as well. Something else we noticed about Nokonoshima Island was the accessibility for those with young children, those with disabilities, or the elderly. Canes were available free of charge for those who needed one to assist in walking the steeper hills and stroller rentals and electric wheelchairs were available as well for small fees. 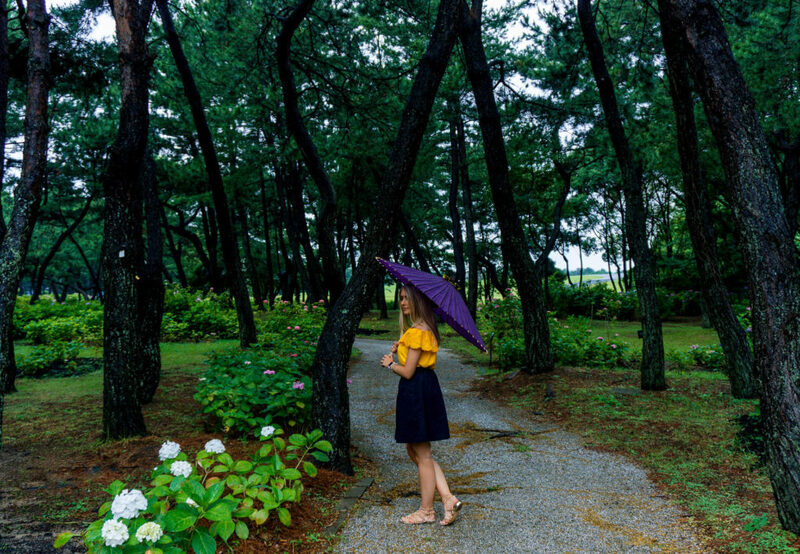 While we only spent a morning here, Nokonoshima Island is a beautiful place to relax from the hustle of urban life and enjoy a romantic getaway or retreat with friends or family and we definitely cannot wait to return. Flower fields at Nokonoshima Island. 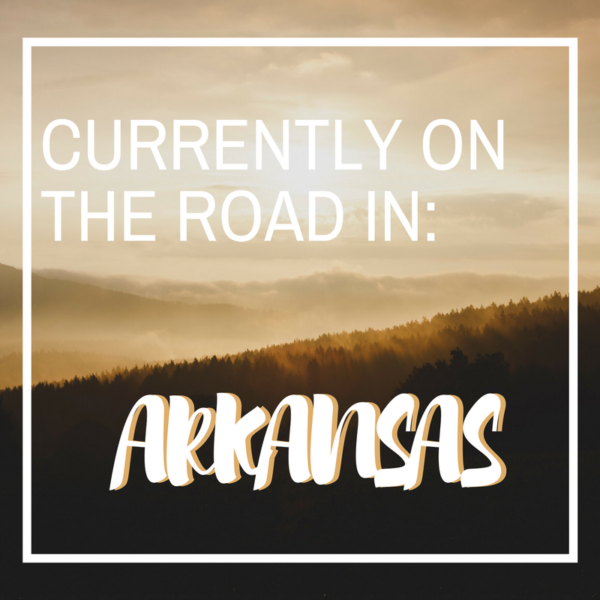 Car: You can also drive to the ferry terminal and park in the on-site parking lot. Time varies depending on your location. Ferry: The Ferry from Nokonoshima to Meinohama leaves every half hour to hour from 5:00AM-9:45PM. The ferry from Meinohama to Nokonoshima is within 15 minutes after. At 234 meters tall, Fukuoka Tower is Japan’s tallest seaside tower. It is commonly referred to as the “mirror sail” as it is made with 8,000 one-way mirrors that glimmer in the sunlight. It isn’t a tower that conducts business but rather a tower that was built for communication and television services. At night, the tower is illuminated by LED lights and occasionally depicts pictures depending on season or holiday. For example, during the spring, the tower illuminates with beautiful sakura trees! Fukuoka Tower is so big it’s hard to capture it! Entering Fukuoka Tower on the first floor you will be able to purchase your tickets and have the chance to take a look at souvenirs or even grab something quick to eat. 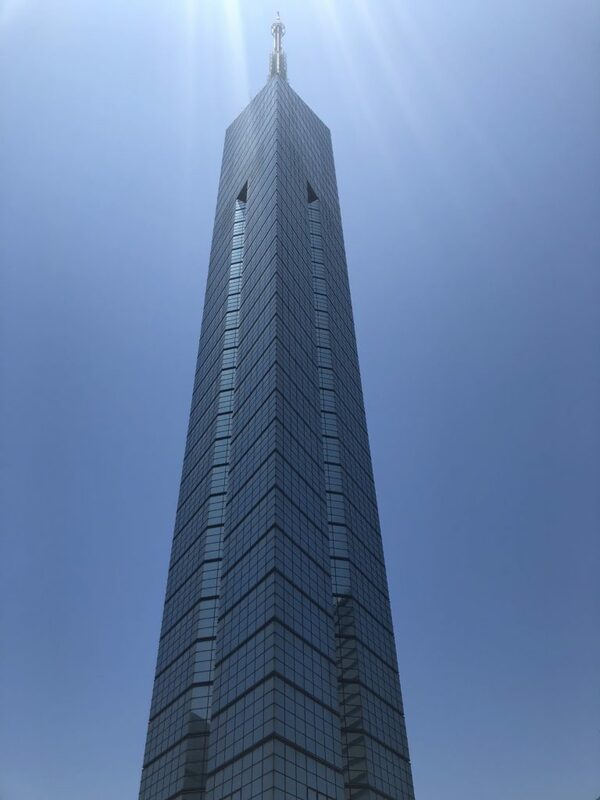 You’ll then get on one of the elevators which will take you to the fifth-floor observation deck that is 123 meters above the ground! From there you will have an outstanding panoramic view of Fukuoka City including sights of Mt. Atago, the Muromi River, Nokonoshima Island, Shikanoshima Island, Uminonakamichi Seaside Park, Hakata Bay and many more iconic destinations in Fukuoka City. 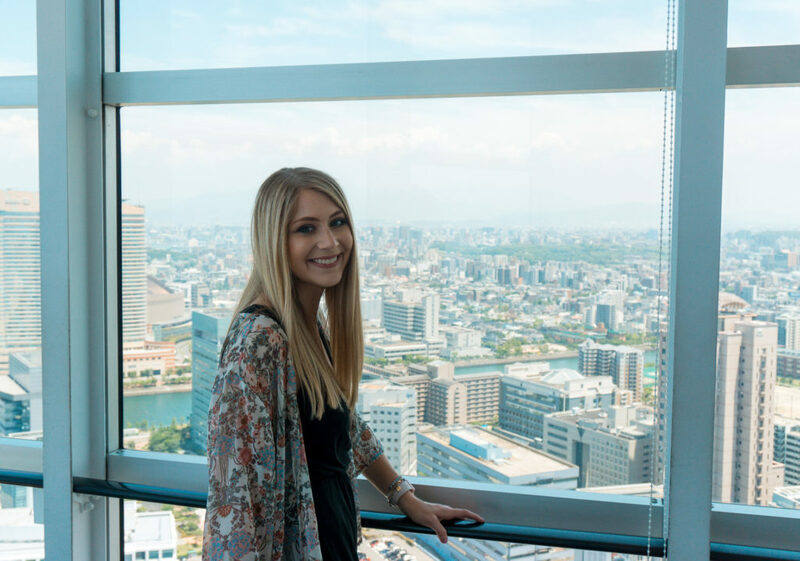 Getting a panoramic view of Fukuoka city from the top floor of Fukuoka Tower! Walking down to the fourth floor there is a dining area called the Sky Lounge which has terrific views of the city from every table – talk about romantic! 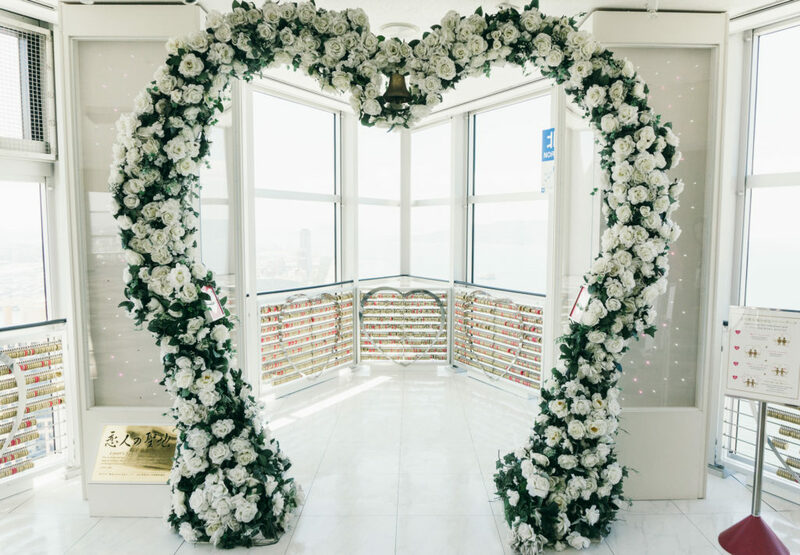 On the third floor, you are able to take the elevator back down to the first floor but don’t go without seeing the Lover’s Sanctuary. 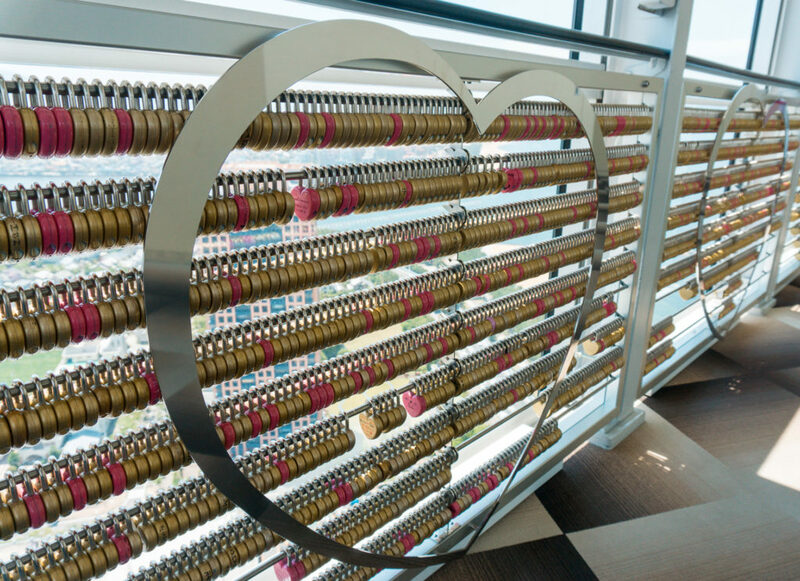 Iconic spots on this floor include the wall where “love” is written in 100 different languages and the hall of love locks which you can purchase one of your own for ¥1,000 and place it in Fukuoka Tower for a lasting memory! 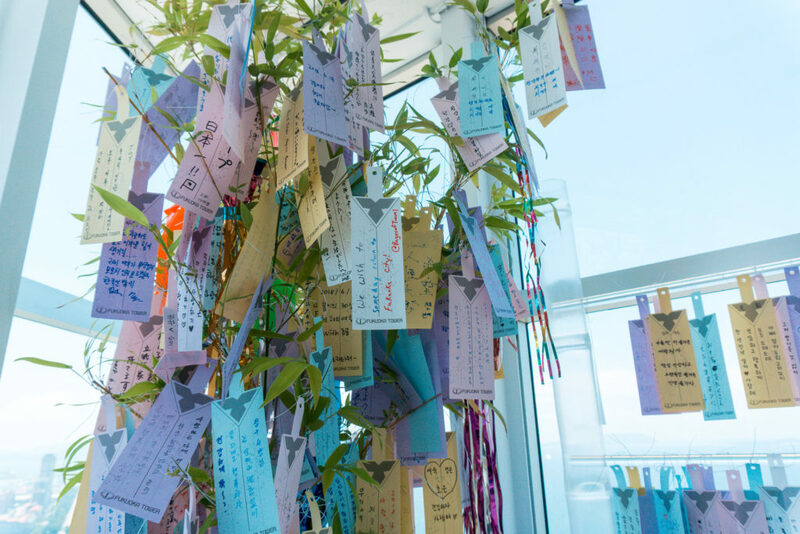 Tanabata wishes tied at Fukuoka Tower. 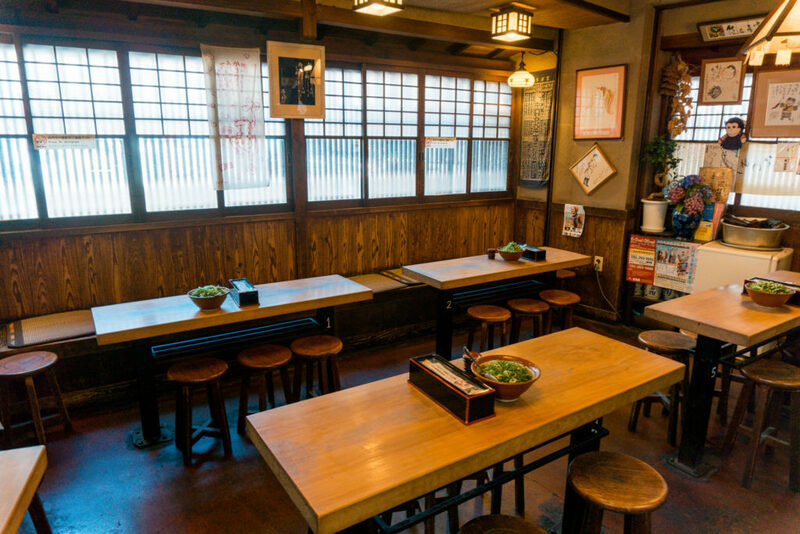 Karonouron is a small, corner side restaurant that was started over 135 years ago by the current owner’s grandmother. Uriu-san, who is now the head chef, has been working at Karonouron for 30 years. 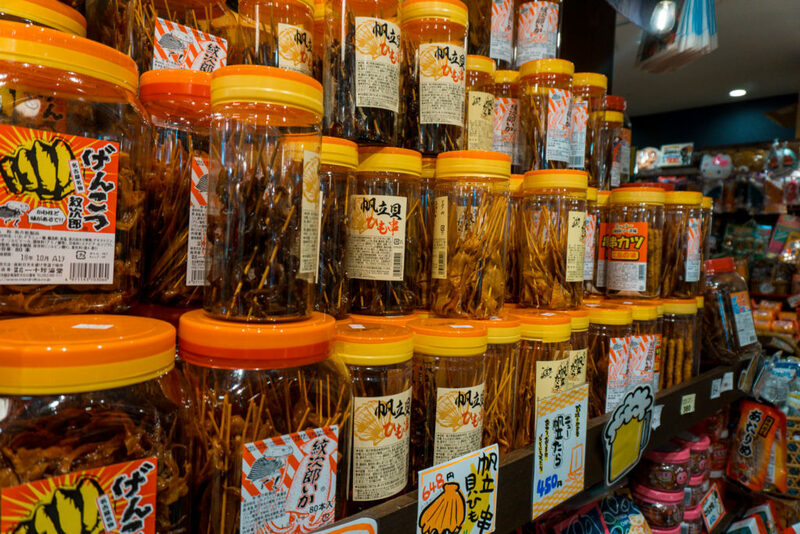 What makes Karonouron different from other udon shops? The family recipe which hasn’t changed since the restaurant’s start. 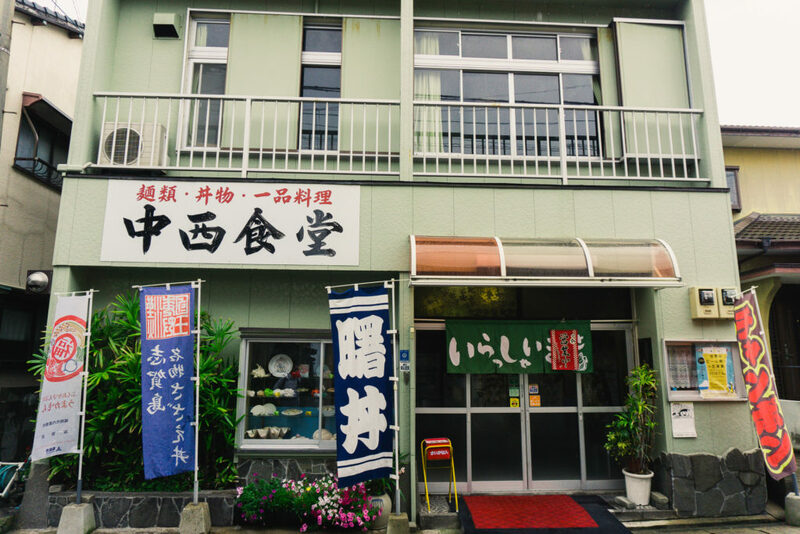 Karonouron uses a special kind of rare seaweed to add flavor to the broth and the udon noodles are made daily by hand. 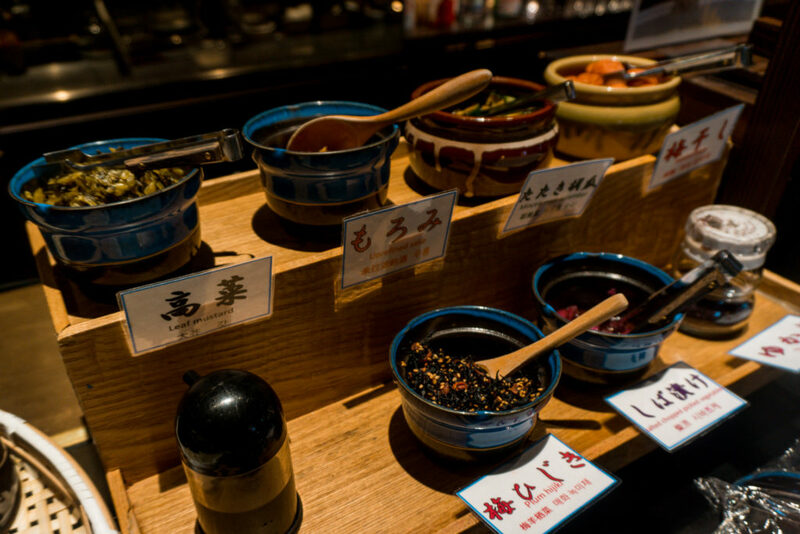 These special touches add to the rich history of Karonouron and the tastiness in their dishes. 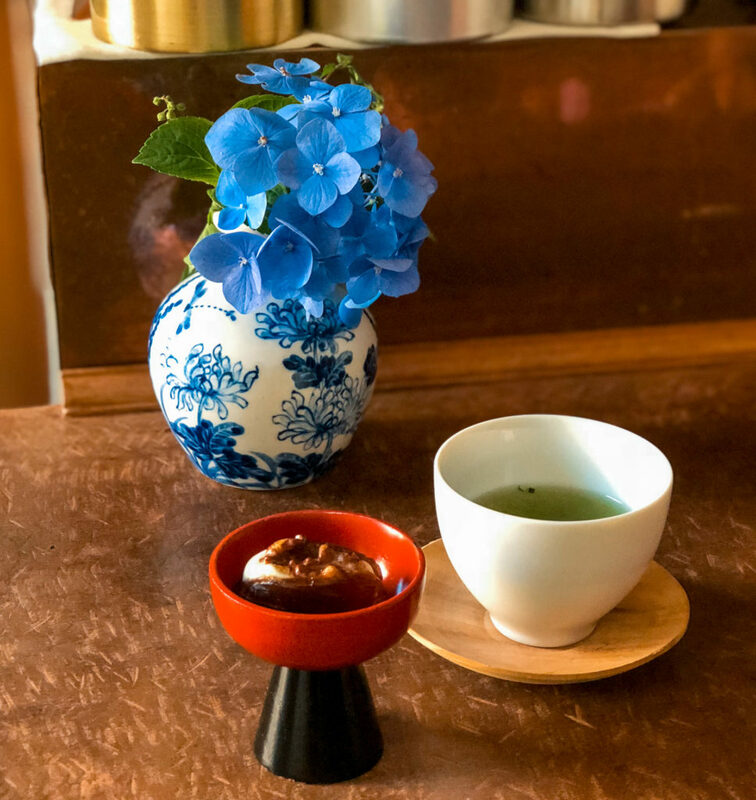 When first walking into Karonouron you’ll notice that it is extremely warm and inviting, there is a space downstairs for customers as well as a few tables upstairs where we were seated. Immediately after we sat down, two glasses of chilled tea were brought to the table, which was perfect for the hot summer day. Bowl of green onion (unlimited to use!) and specially made chicken onigiri from Kuranouron. A bowl of freshly chopped green onion was placed on the table, which is provided to all customers at no additional charge so you can add as much as you’d like to your udon bowl. To start our meal we both received a specialty side of Karonouron, chicken onigiri. We fought the urge to devour them immediately, as to allow ourselves to enjoy them with our udon. As we would soon find out, the flavor of the chicken broth soaked into the rice was incredible! We each tried a different type of udon from Karonouron. Logan got the udon with a fried fish cake and I had the specialty of Karonouron, udon with fried burdock root. Both of them were exceptional! The batter of the fried fish and burdock root stayed crisp as it sat in the bowl of rich udon broth and the thick cut udon noodles were perfectly chewy. We’d be hard-pressed to find a bowl of udon better than that of Karonouron. If you’d like to try Karonouron for yourself we recommend getting there early – once the udon is gone they close up shop! 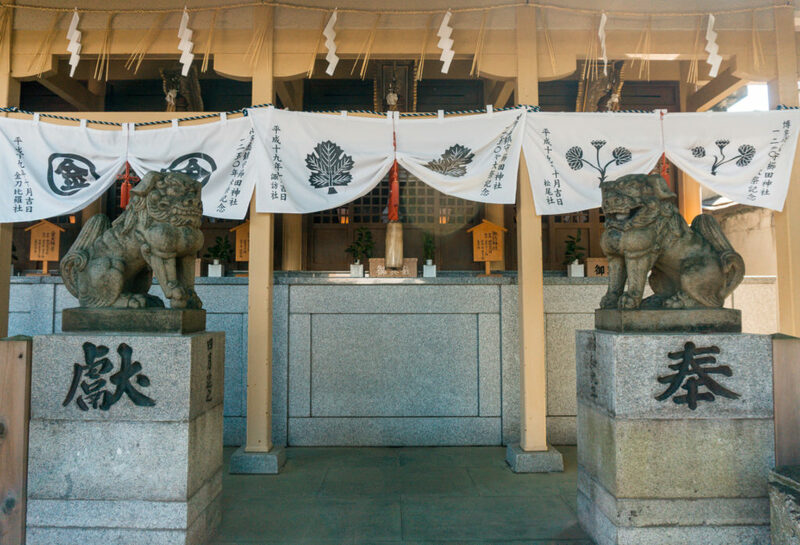 Kushida Shrine was founded in 757 and is considered to be one of the oldest shrines in Fukuoka City. 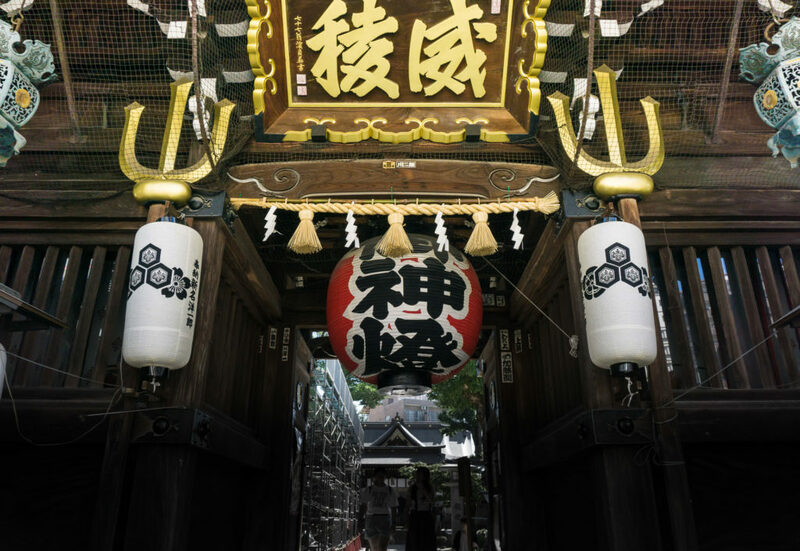 This shrine hosts a few different deities but there are three main deities including Amaterasu, Ohatanushi, and Susano. 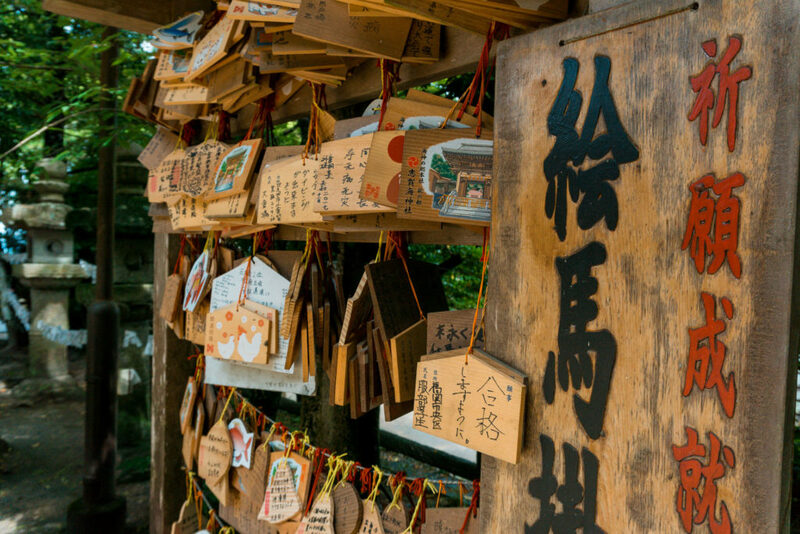 People typically come to Kushida Shrine to pray for the longevity of life and success in business. Kushida Shrine has another importance as well. Each year from early to mid-July Kushida Shrine is the host of Hakata Gion Yamakasa, the biggest matsuri (festival) held in Fukuoka. On the last day of the festival seven different teams representing the seven different wards of Fukuoka City race carrying kakiyama floats. 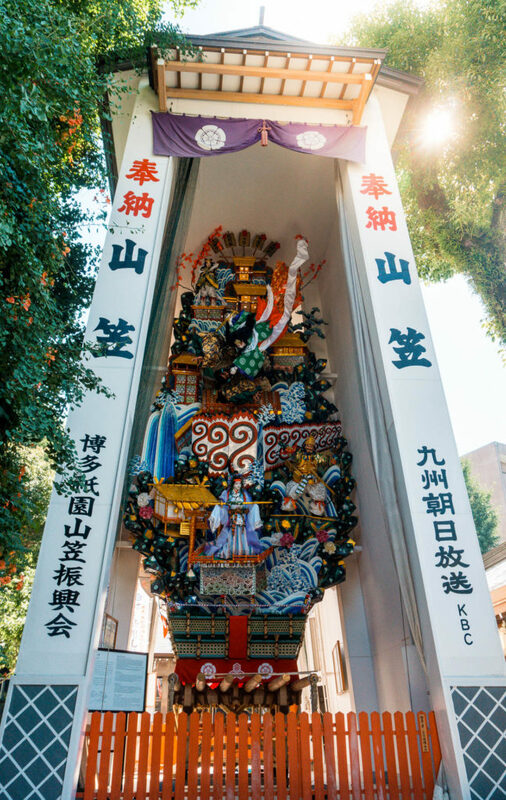 There are also large decorative kazariyama floats that are displayed around the city, including one at Kushida Shrine. The permanent floats that are featured around the city stand 10 meters tall and weigh roughly 2 tons! 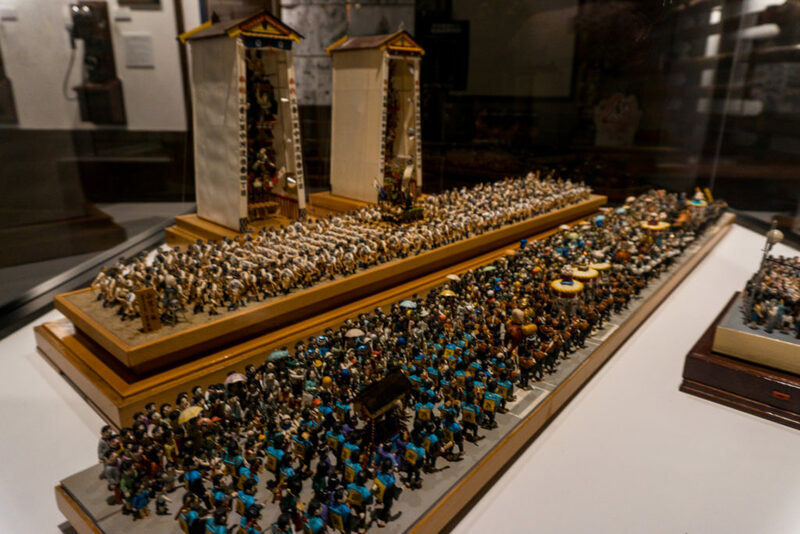 Hakata Machiya Folk Museum is the perfect place to go and learn about the many annual matsuri (festivals) that happen in Fukuoka, especially if you aren’t able to visit Fukuoka during one of the festival seasons. Hakata Gion Yamakasa is the matsuri we learned the most about at Hakata Machiya Folk Museum as it was coming up in just a few short weeks. The museum has an informational video about the festival that is incredibly fascinating. We watched the documentary in awe as it depicted the process of building the floats by hand and with primitive tools. As we mentioned before, Hakata Gion Yamakasa is a tradition that takes place every July, but those involved are preparing for the festival long before that. The floats are made without any nails, only wood and rope. There are weeks of preparation, practice runs, blessings, and then the big day! On the morning of the Oi-Yama race, many in the city do not sleep, as they are anxiously awaiting the start of the race. On the morning of matsuri, at 4:59am the race begins to see which ward will have the honor of taking first place. 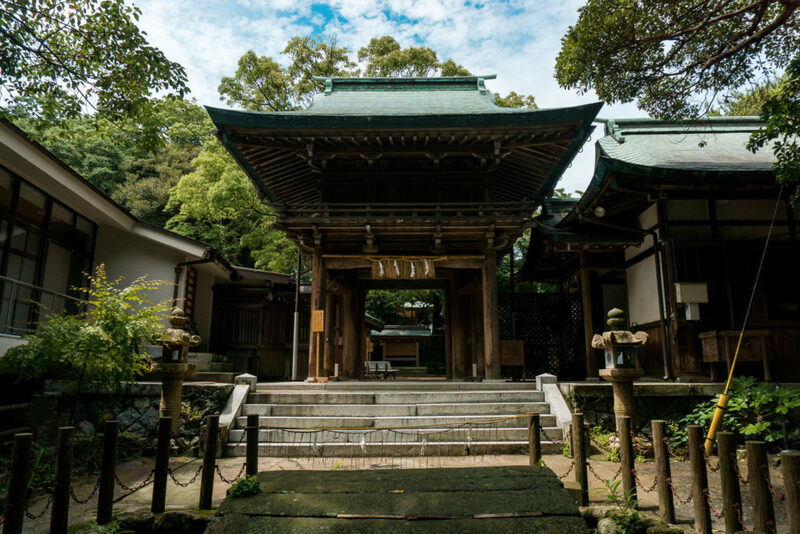 Tochoji Temple may be in the city but once you enter the temple gates you’ll be immediately surrounded by tranquility. 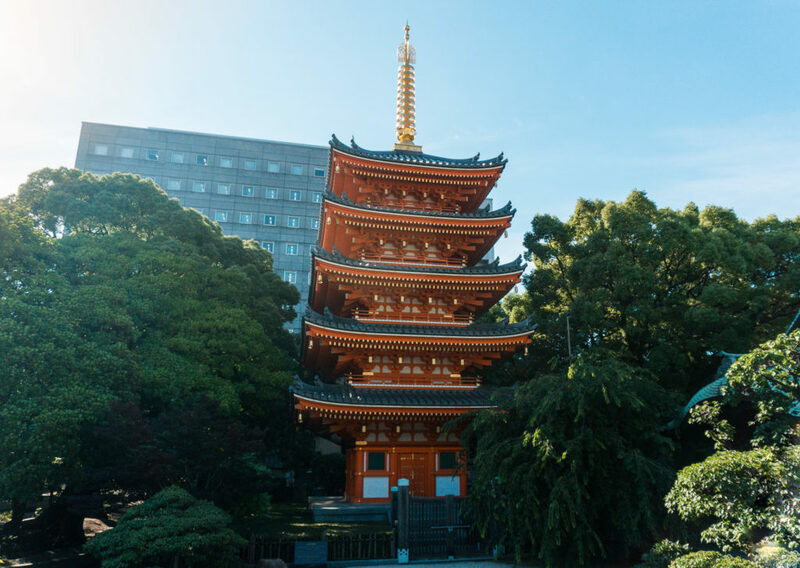 On the temple grounds, you can gaze upon a five-story pagoda that stands glimmering in the sun. 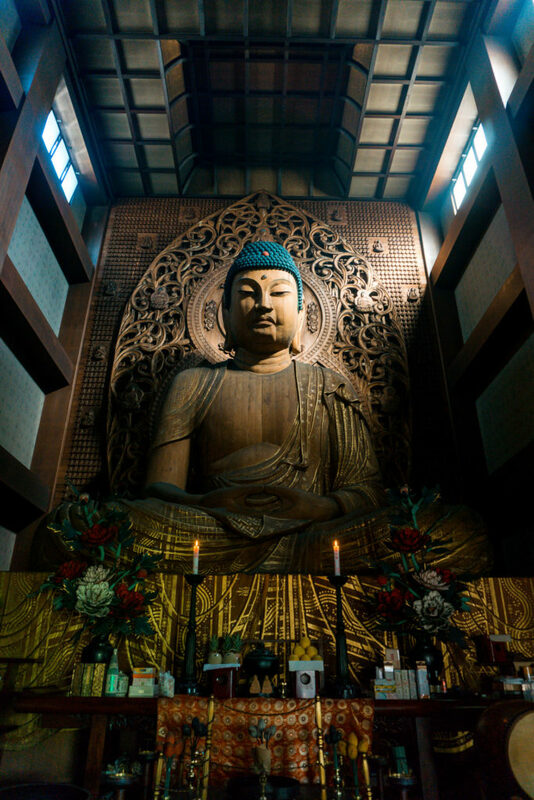 On the second floor of the temple, you will be marveled by a large wooden statue of Buddha that is seated on a pedestal, in fact, it is the largest of its kind in Japan. We spent a few minutes simply smelling the incense, listening to the light creaking of the floorboards, and gazing upon the statue – taking it all in. After paying respect, you can walk through a room behind the displayed Buddha and see the artistic depictions of the realms of hell. After seeing viewing you will then go into a pitch black tunnel where you will try to feel around to find a metal ring situated on the wall (about the size of a coaster) which will lead you safely to the other side. After making it through the dark tunnel, you will be greeted by more artistic depictions, but this time of heaven. The experience is rather unique and at times chilling. Disclaimer: You are typically not allowed to take photos of the wooden Buddha at Tochoji Temple. We were granted permission due to our partnership with Welcome Fukuoka. Yorozu is a newer establishment in Fukuoka, having only been open for six years. 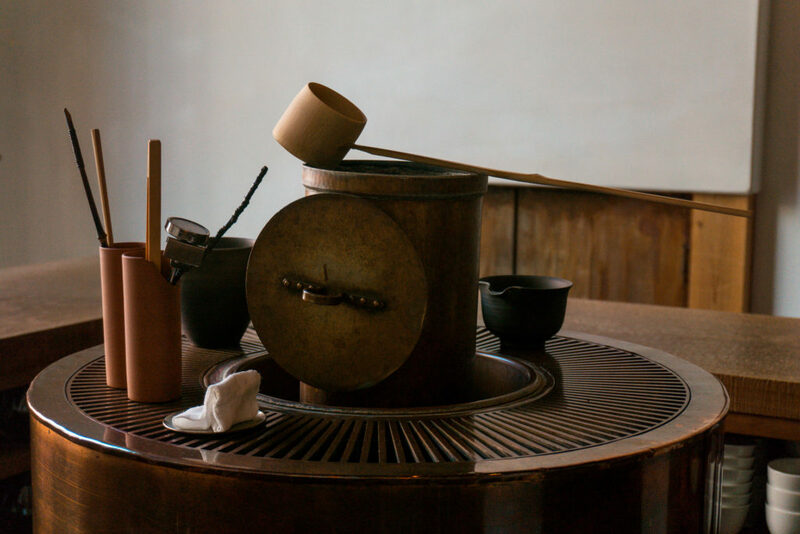 But that doesn’t take away the heartfelt history and the meaning behind the art of tea. When you walk in you are greeted by a sensational aroma of tea and the beauty of the cherry tree table that welcomes you to sit at it around the stove. The stove you see here is not just a place to boil water and make tea, its meaning goes much deeper than that. In days prior, many family homes had stoves as such. Families would sit around the stove cooking, eating, and enjoying each others company. The owner of Yorozu, Tokubuchi-san, wants to bring that idea of family time or kazuku dan ran (good time with family), back to today’s generations. Since it was quite warm the day we visited, the first tea we tried was a cold brew green tea that was slowly dripped over 8 hours. It has a light and refreshing flavor that is perfect for summer. The next course of tea we tried were all brewed with the same tea leaves. However, each serving had a different unique flavor due to changes in long it was brewed as well as varying temperatures. We noticed the taste shifted slightly with each change making it have a deeper flavor. 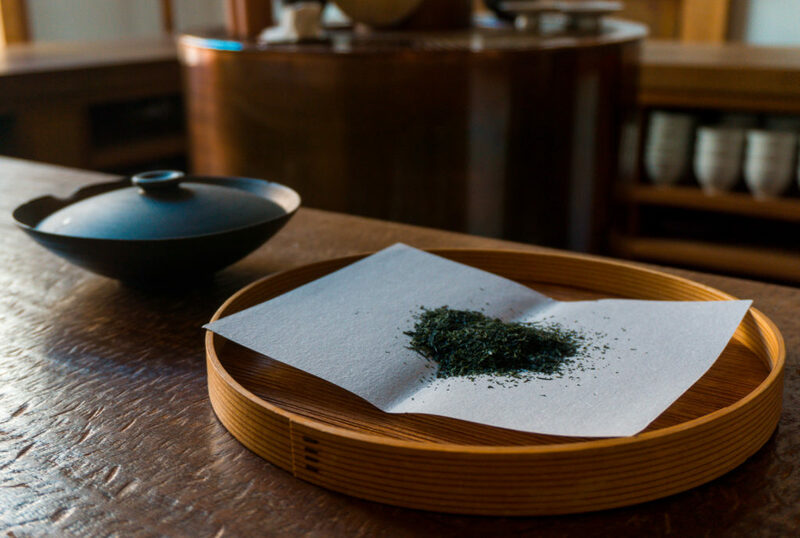 With each tea that was prepared and poured, we noticed how methodical the steps were and became mesmerized by the process as if we were watching a piece of artwork come to life. 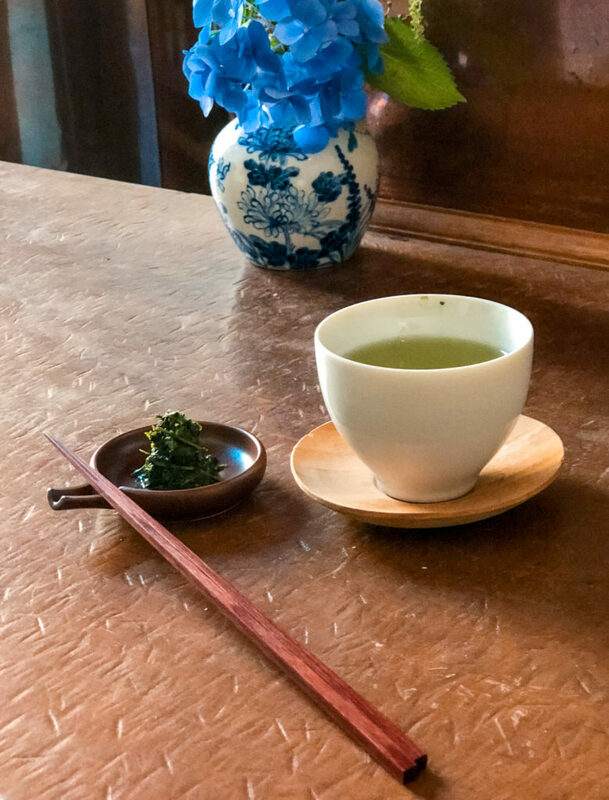 The first tea we had was brewed at 35 degrees Celsius, it is known as Hatsuhana (first flower). 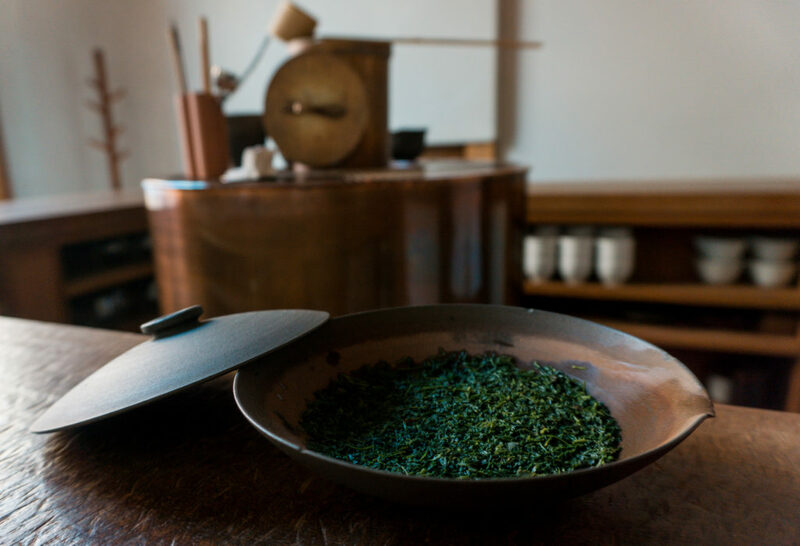 The 2nd tea was brewed at 50 degrees Celsius, the 3rd tea was at 80 degrees Celsius, and finally, the 4th at 90 degrees Celsius – here the flavor reached its peak and was rich and robust. Tokubuchi-san talked about how the brewing process of tea can be compared to relationships. When first meeting someone the relationship may lack the warmth of a true friendship and the “flavor” is mild, but as you get to know someone the relationship becomes warmer, flavor deeper, and even more inviting. 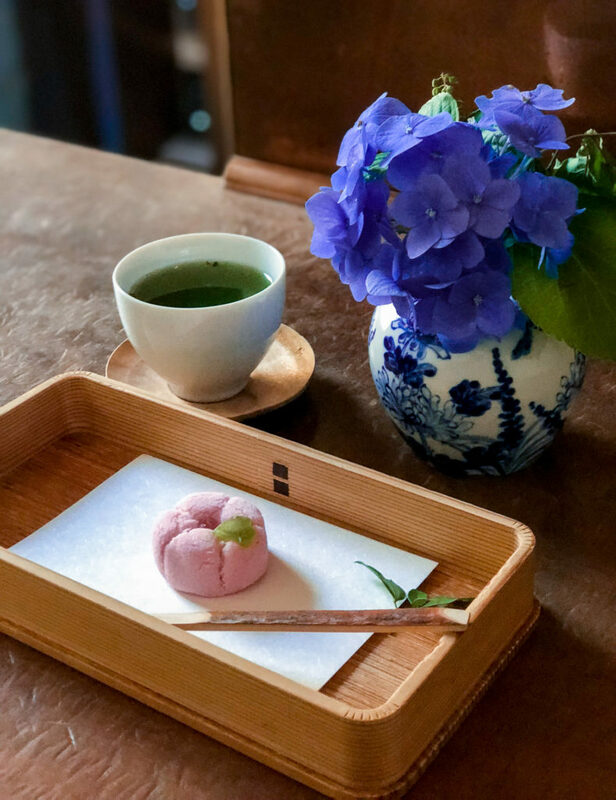 At the end of our tea tasting, we tried some delicious wagashi, which are beautifully crafted traditional Japanese style sweets. 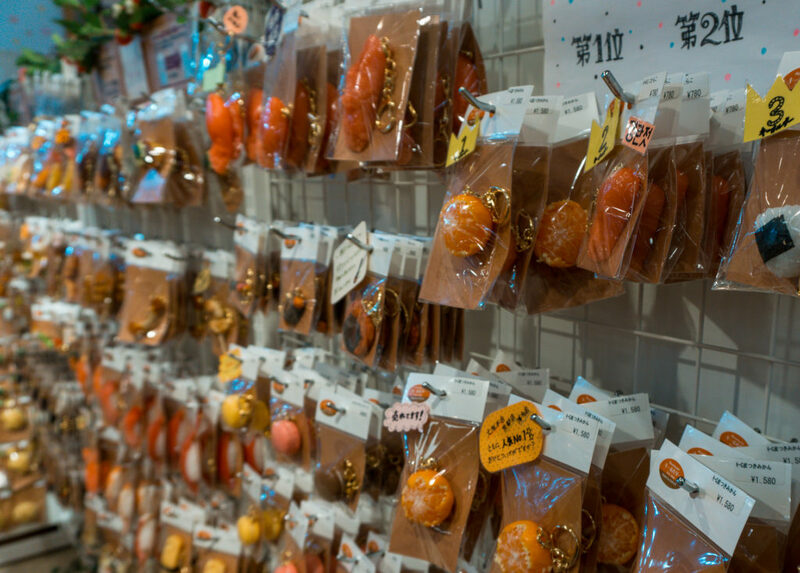 Each treat being from well-known confectionaries in Japan, make with local seasonal ingredients. Logan had the Ajisai (hydrangea) shaped wagashi and I tried the Manju cake. Both meticulously plated and served with our final cup of tea. 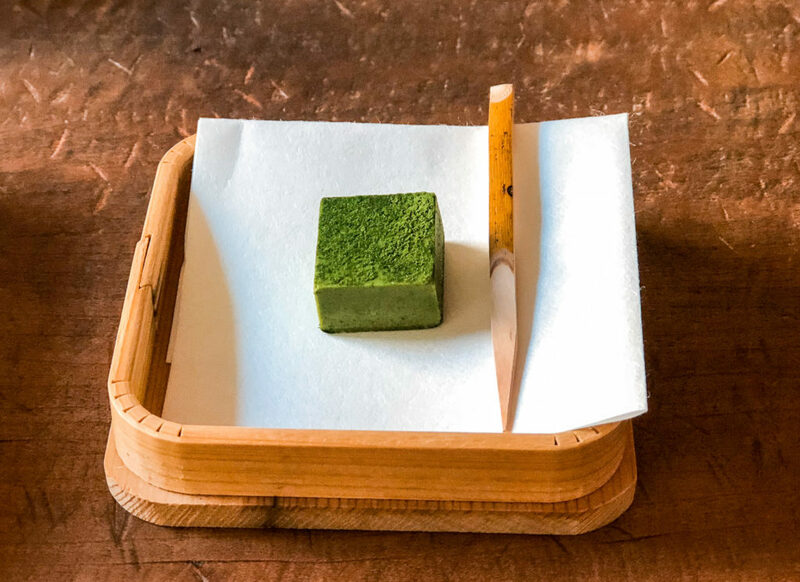 The second treat course included: a date with walnut and nutmeg for Logan, and a matcha dusted tofu chocolate for myself. The tofu that was so rich and creamy, I was surprised to learn that it contained only half the sugar that you’d find in normal chocolate. For the final course, Tokubuchi-san took the tea leaves used to brew our tea and added a bit of ponzu sauce for us to eat. It was a nice touch to have a bit of savory and salty flavor after all the sweets and as well as enjoy our tea in a new way, one last time! Yorozu takes you to a place you hope you experience if only for a moment when visiting Japan. 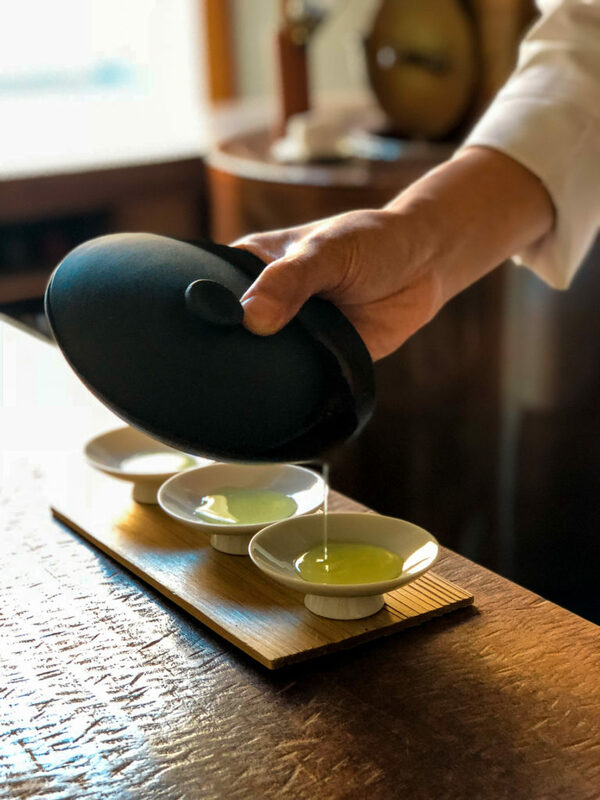 The meticulous detail and craft of making tea and beverages is the perfect marriage between traditional Japanese tea making and modern elegance. 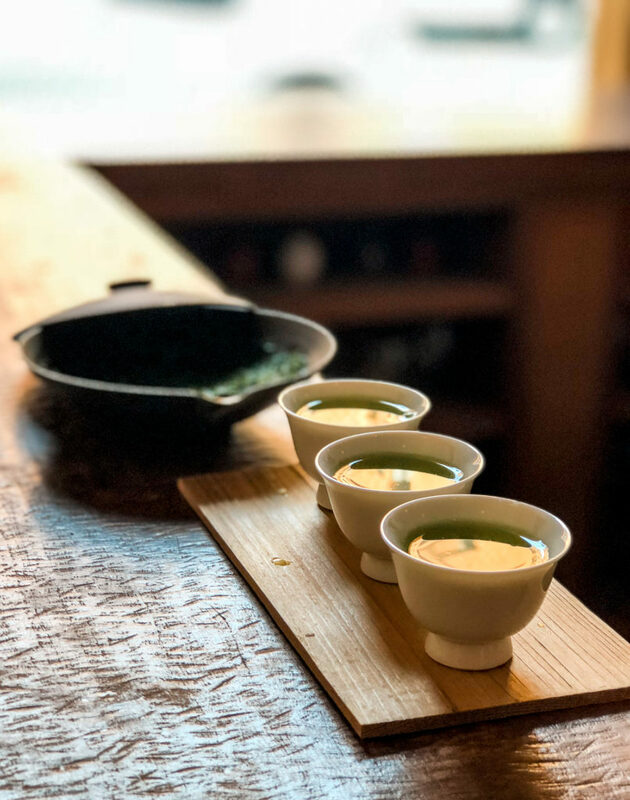 Whether you are a tea connoisseur, a family looking to experience something unique, or someone wanting to indulge in a cocktail and stoveside conversation, Yorozu is an experience that will leave you entranced until the last drop. Nabemono, or simply put Nabe is a Japanese-style of cooking commonly referred to as “hot pot.” It typically consists of one pot with numerous ingredients often cooked at the table in a boiling broth. 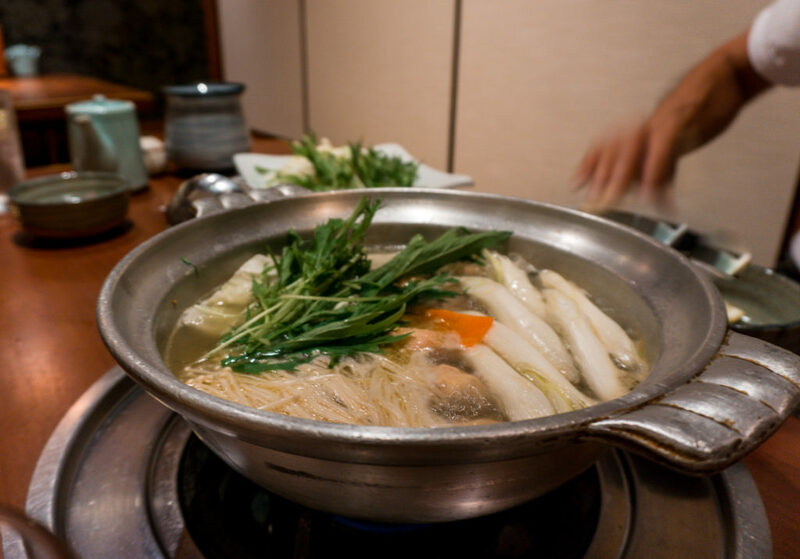 Prior to visiting Hanamidori, we had an experience with this cooking style with a crab hot pot, however, on this occasion, we had mizutaki or chicken hot pot. 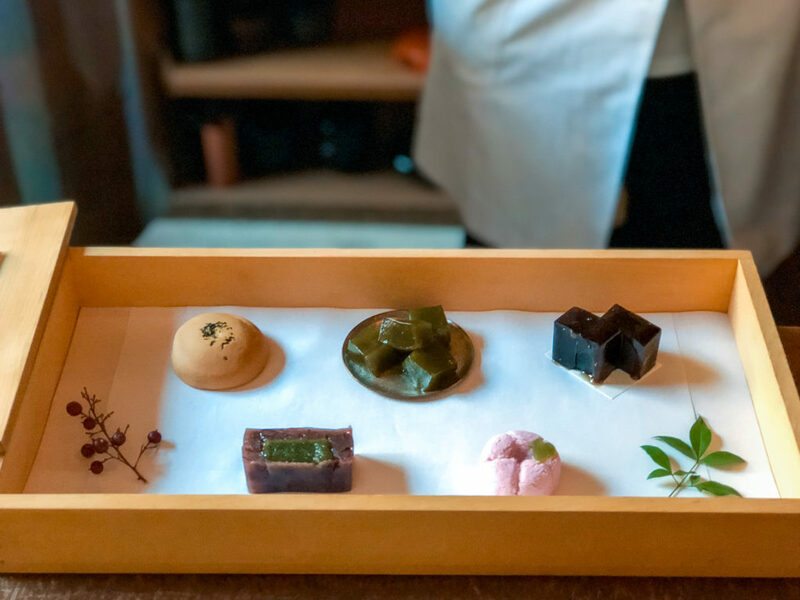 Before we began cooking our hot pot dish, we first received a variety of appetizer dishes that reminded us of kaiseki dining (assorted small plates). These small dishes included egonori (seaweed noodle), cod roe, pumpkin tofu, roasted eggplant edamame, and a seared chicken ham. After enjoying our small plates, we were brought a large pot of broth that quickly began to boil on the hot plate. Our server carefully placed each piece of chicken in the broth and formed perfectly round chicken meatballs (which our favorite) that were placed in the broth to cook. Hanamidori has a specialty broth which accentuates the flavor of each piece of chicken as well as making it moist and tender. After our chicken had cooked for a little while, we added some vegetables to simmer including bok choy, carrots, mushrooms, and tofu. At the end of our meal, we were given a bowl of champon noodles that were served in a light but flavorful broth. For dessert, we had a delicious and sweet egg custard that really completed the meal. As most major cities in Japan, Fukuoka has a number of public transportation options to get you around the city. However, there are limited options for travel via JR trains in Fukuoka City so those utilizing the JR pass will need to be aware of alternative means of transportation. Nishitetsu: One of Japan’s “Big 16” private railway companies is Nishitetsu, it offers the largest coverage of public transportation in Fukuoka city. Nishitetsu local bus offers a large area of coverage in Fukuoka with numerous stops across the city. Nishitetsu also has a train service throughout Fukuoka City. Nishitetsu offers a wide variety of transportation passes that you can explore here including the following. Marutto Fukuoka pass(http://www.nishitetsu.jp/en/ticket/marutto/), which is available only to foreign visitors. The Marutto Fukuoka pass is ¥2,000 for adults or ¥1,000 for children. It includes a Fukuoka City one-day bus pass, and one-day train pass (good for Nishitetsu Tenjin Omuta, Dazaifu, and Amagi lines), and a free Fun Pass Fukuoka. 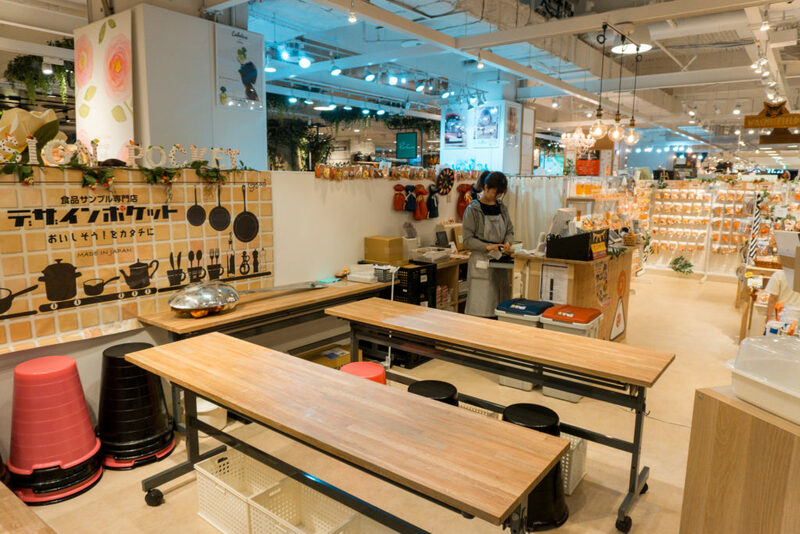 Fun Pass Fukuoka is a coupon book that offers discounts and information about dining, experiences, and shopping in Fukuoka City! A Nishitetsu one-day pass is also available for purchase for ¥900 for adults or ¥450 for children. Another option is the Fukuoka Tourist One-Day City Pass that is available for ¥820 applicable for the Nishitetsu bus, subway, JR (local and rapid trains), and the Showa bus or ¥1,340 for those mentioned previously but adding the Nishitetsu train. A rechargeable IC card called Nimoca for use on public transportation, which works similarly to the Suica and Pasmo card found in Tokyo. Nimoca card can also be used for purchasing certain goods at a variety of retail locations. Because we were traveling around the Kyushu region we chose to spend our 2 days in Fukuoka traveling by rental car, although if we were coming to visit again, we would utilize public transport as it is the most convenient way to see the city and you don’t have to worry about finding public parking and paying for parking fees. Another easy way to visit different parts of Fukuoka is by calling a taxi. In the evening when we didn’t have far to go, but still would be a long walk we utilized a taxi to take us to a few places that were within walking distance of one another. You can always try to flag a taxi down or simply ask someone “takushi noriba–wa doko desu ka?” (where is a taxi stand?). 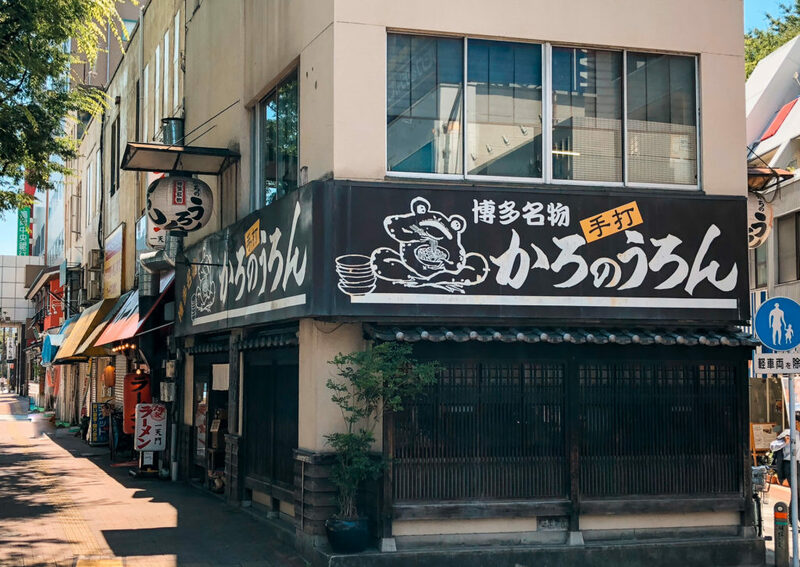 If you are leaving a restaurant or your hotel often times you can ask one of the staff to call a taxi for you by simply saying “Takushi-wo kudasaiI” (roughly “taxi please”). There is also a taxi app in Japan but its coverage areas vary depending on where you are and where your destination is. Here is our Fukuoka itinerary that we followed during two days in Fukuoka. 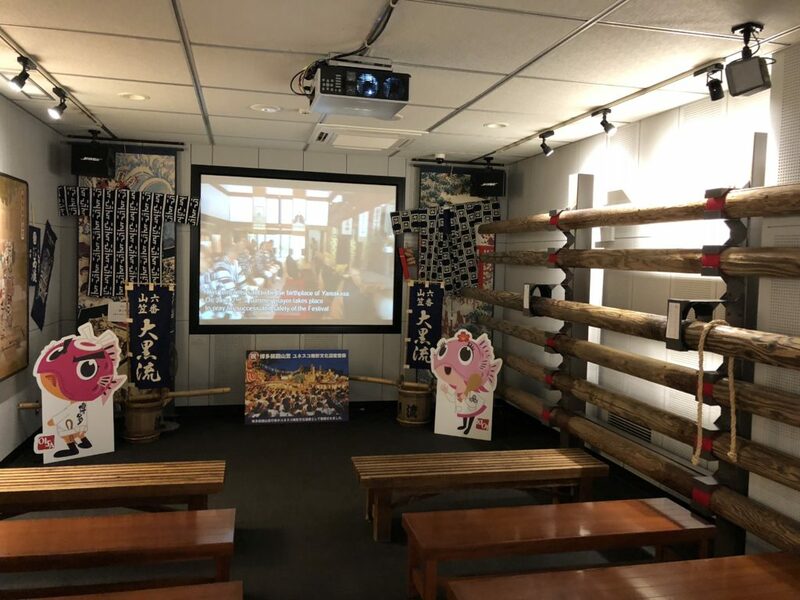 You can easily save this section to create your own Fukuoka itinerary! 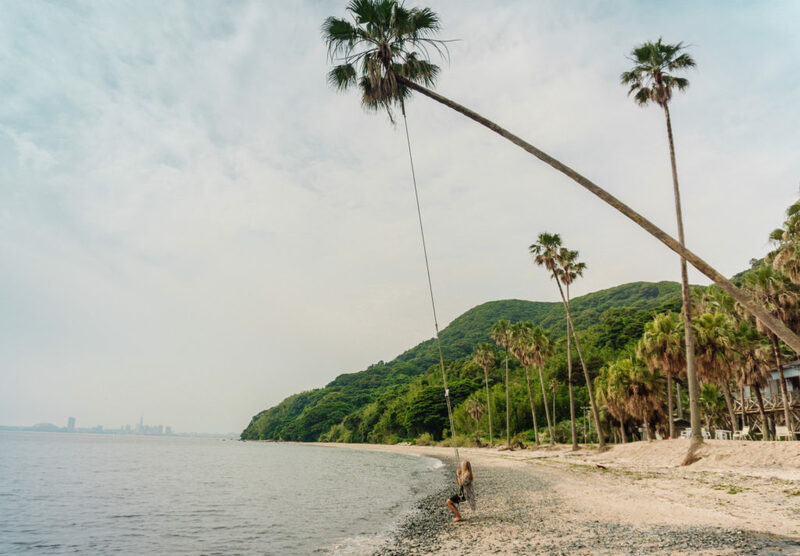 Start your morning at Uminonakamichi Seaside Park. Rent bicycles at Shikashima Cycle to explore Shikanoshima Peninsula. 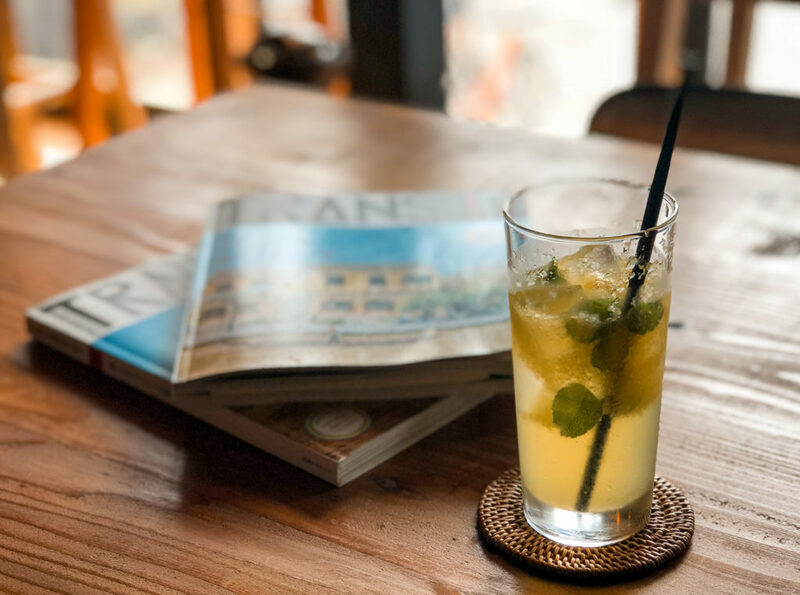 Return bikes and grab a refreshing drink at Shikanshima Cycle Cafe! 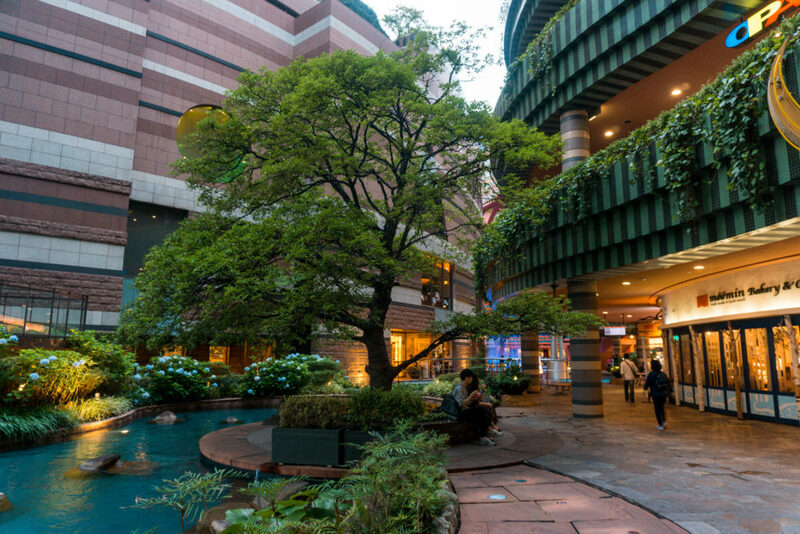 Go shopping at Canal City Hakata and stay for the latest Aqua Panorama Show. 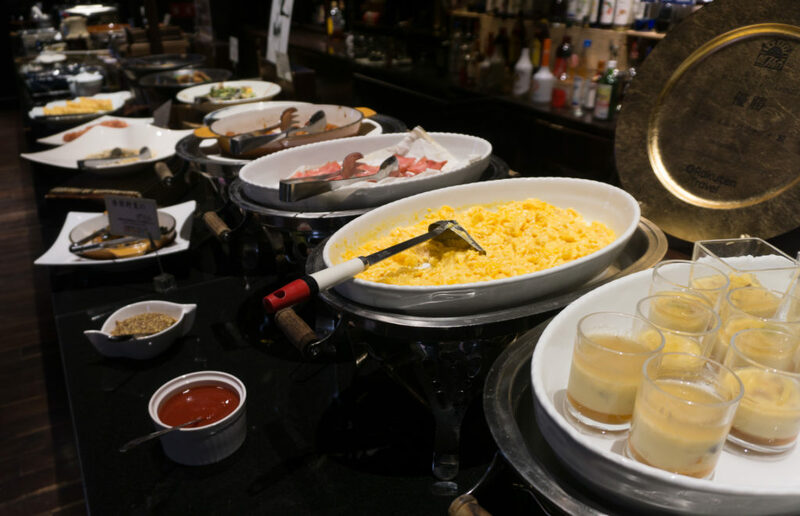 Wake up early and grab breakfast at your hotel – we were impressed with the breakfast spread at Hotel Il Palazzo. 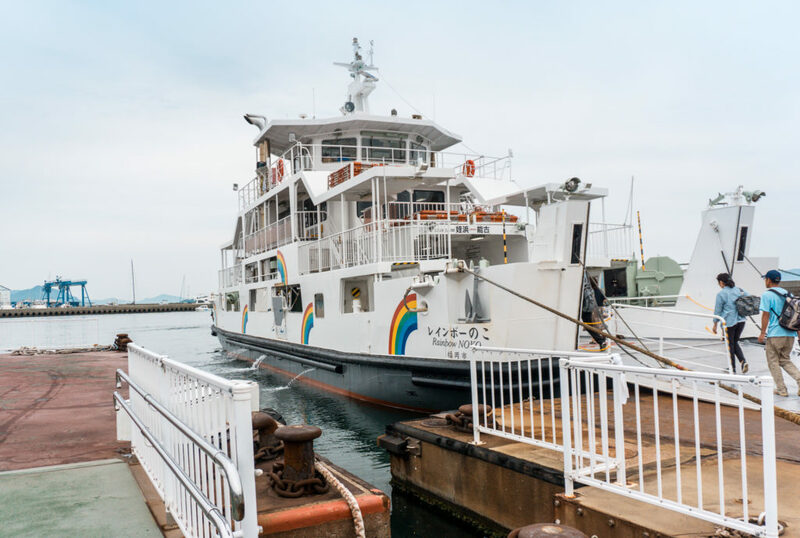 Take the ferry to Nokonoshima Island (You’ll probably spend a few hours here!). Return on the ferry to the main city. Take the elevator up to the top of Fukuoka Tower – the views of the city are incredible! Lunch at Karonouron (the best udon we’ve ever had! Get #1 with burdock root). 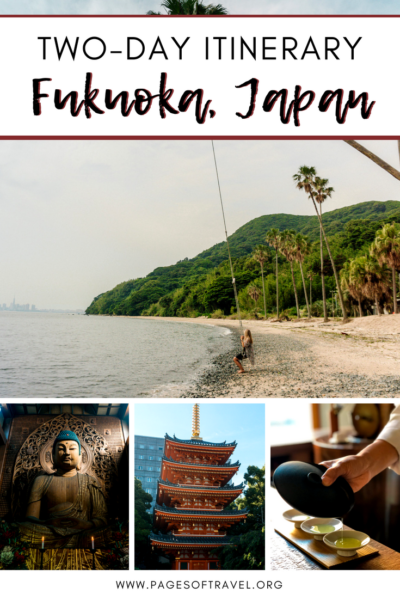 Fukuoka quickly became one of our top cities to visit in Japan and we hope that this Fukuoka itinerary has inspired you to head south on your trip to the Kyushu region and visit Fukuoka!